When Charles Darwin visited the islands on HMS Beagle in 1535, a fundamental development in his thought process took place. Darwin’s theory of evolution by natural selection presented in the Origin of Species had set the wheels of motion to change how the human race would view the Universe. 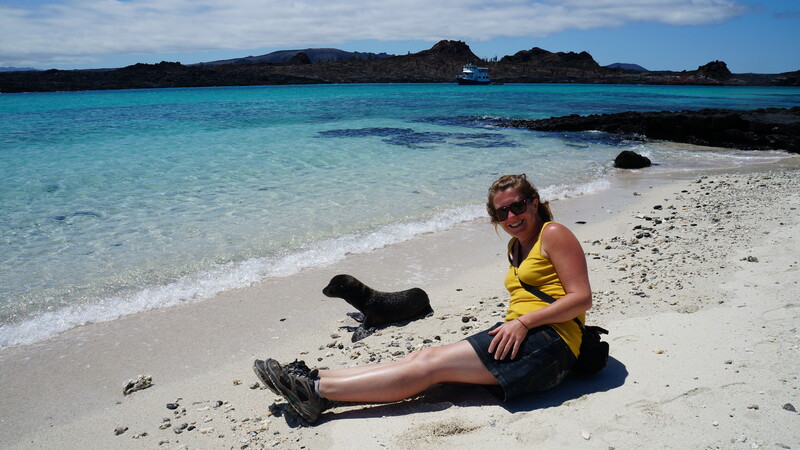 We’d dreamed of visiting the Galapagos islands for a long time and although they’re not strictly affordable on a backpacker’s budget, we’d put a chunk of cash aside especially for this trip – the equivalent of nearly two months budget! 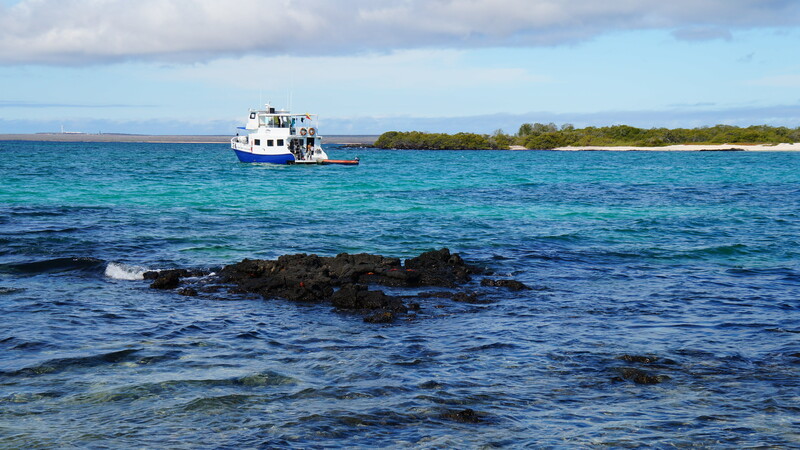 We’d heard that it was possible to visit the islands independently but the very best way to experience the wildlife and the many smaller beautiful islands was to take a boat cruise. 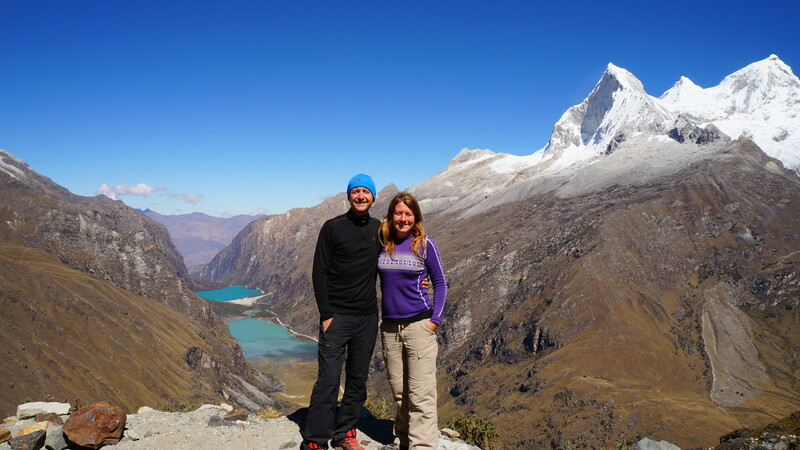 Our plan was to spend five days on a boat and five days relaxing on two of the larger islands – Santa Cruz and San Cristobal – in an attempt to see and experience as much as possible. From the coastal city of Guayaquil we booked flights (into Santa Cruz and out of San Cristobal) and also our boat cruise. Booking a cruise a few days before it’s due to depart is a great way to save a few hundred dollars as the captains are keen to fill up the boats, but it’s best to keep in mind that in high season (July and August and around Christmas) you could be waiting for a few days or weeks before you get the package you want as many of the boats are booked up months in advance. It’s also possible and very straight forward to fly to Santa Cruz and arrange your trip there for the best prices with one of the many agencies. Two guys on our cruise paid $100 USD less per person than us by doing this but they did have to wait for several days on the island before the cruise departed, so if you’re on a tight timescale this isn’t necessarily the best option. 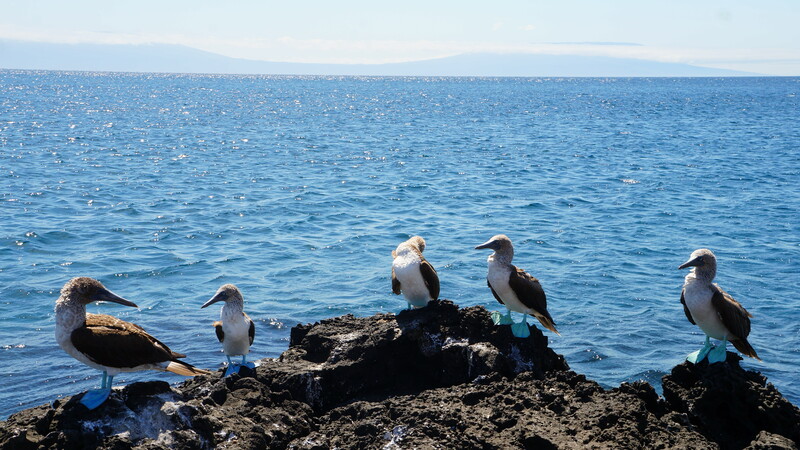 There are around 85 boats to choose from in the Galapagos, ranging from 10 person motor boats to cruise liners holding 100 passengers. The class of boat also varies widely, and you can find yourself on comfortable but basic boats with smaller cabins and cold water showers or first class yachts which offer more luxury than your wildest dreams can imagine. The most important thing to bear in mind when choosing a boat is the itinerary – what you hope to see and where the boat will visit. 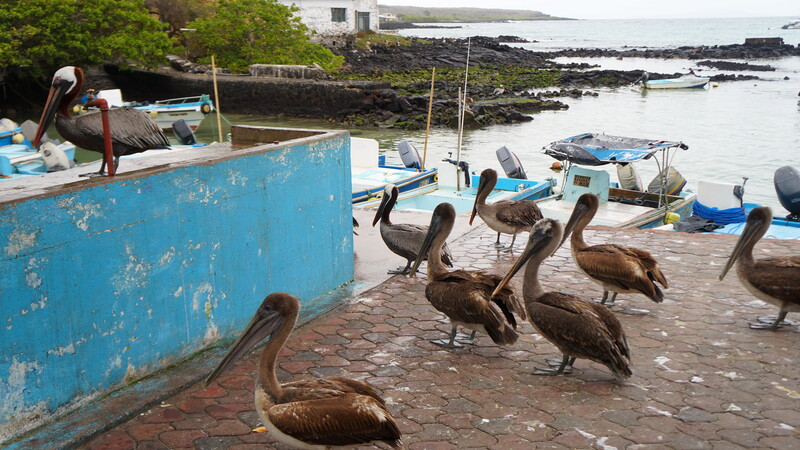 New regulations in the Galapagos mean that boats are required to wait 2 weeks before visiting the same site again, in an attempt to make sure the most popular places on the islands are not overrun with people, so schedules change constantly. Also, visits to sites are only allowed in small groups (usually larger boats will have a guide for every 10 or so passengers) and in 2 to 4 hour shifts to limit the impact on the area. We picked ‘King of the Seas’ – a tourist class boat holding 14 people – because we wanted a less expensive and more intimate trip. 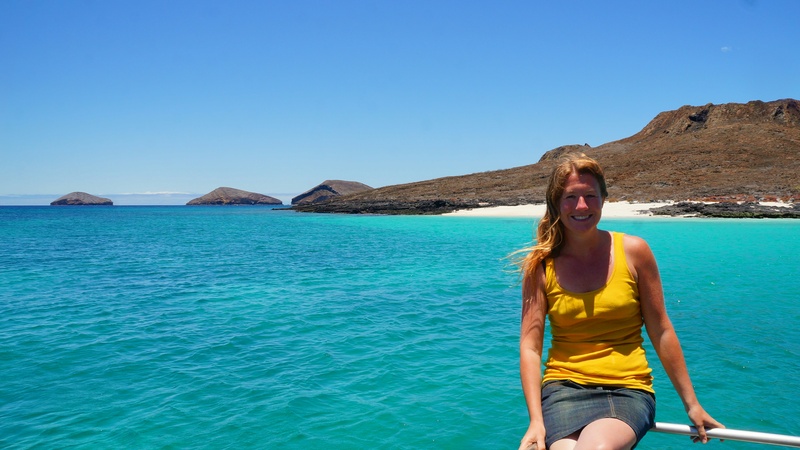 When we say ‘less expensive’ what we actually mean is – $700 USD per person for a 5 day all-inclusive boat trip, plus airfare of $400 USD, National Park entrance fee of $100 USD per person and airport tax of $10 USD per person – so not just small change! As we booked our trip last-minute in Guayaquil after spending a day shopping around and some hard bargaining, we managed to get $500 USD off the standard price for the cruise but it was still pretty painful to hand over that kind of money. 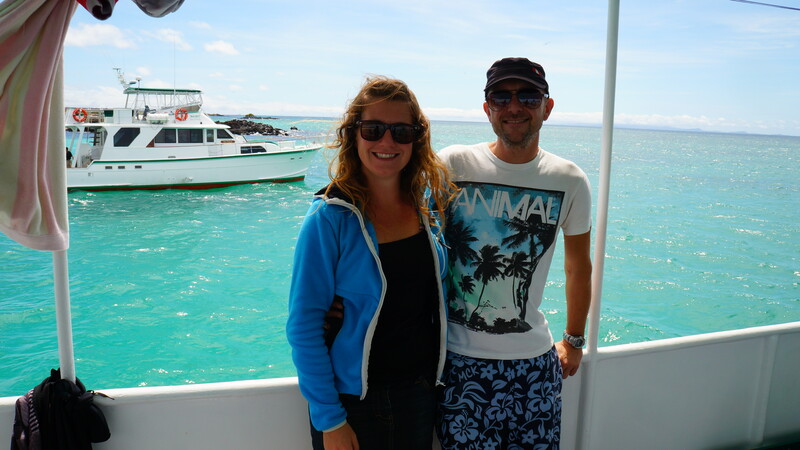 Once we arrived on the islands we vowed not to think about the money and just enjoy our experience and as soon as we saw our boat and met the other passengers we’d be spending our first five days with, we knew that we were going to have a fantastic time. The archipelago consists of 18 major islands, 3 smaller islands and 107 rocks and islets. Straddling the equator, the islands are located in both the northern and southern hemispheres and cover an area of 8,010 square kilometres. 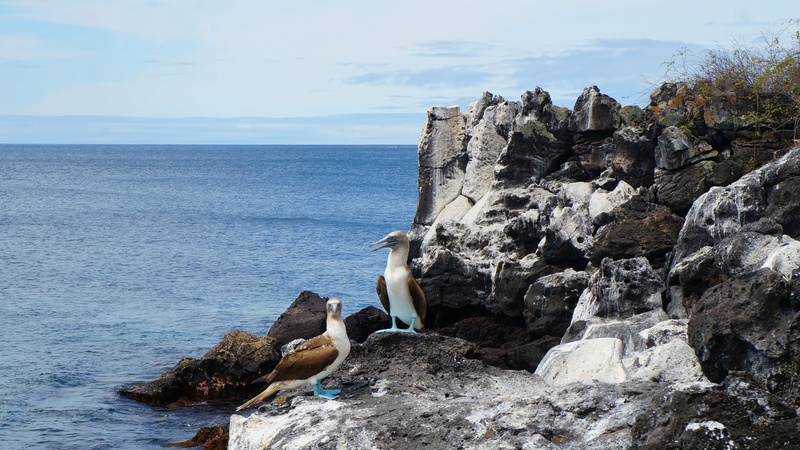 97.5% of the area is designated a biological marine reserve so it’s necessary to be accompanied by a guide or take a tour to any protected areas. 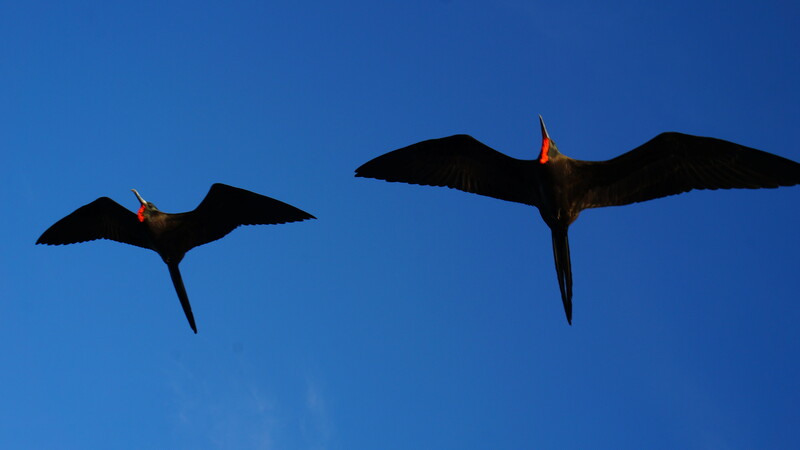 In total there are 116 visitor sites – 54 on land and 62 scuba diving and snorkeling. 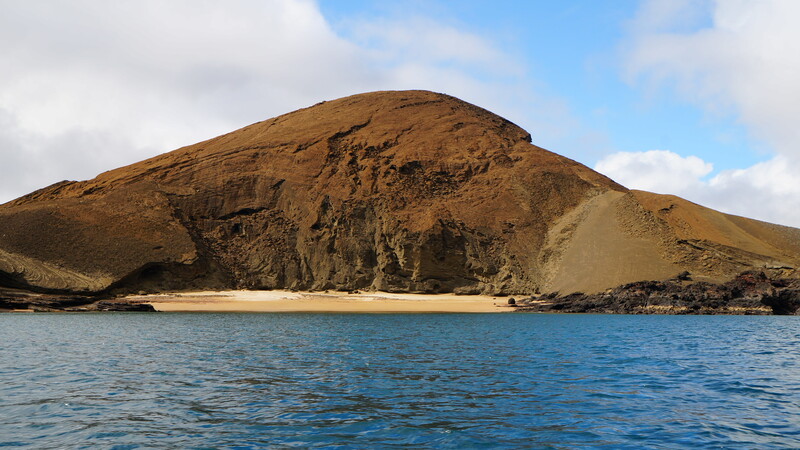 Our boat trip would take us to the central islands where we’d see Bachas Beach, Sullivan Bay, Bartolome, Santiago, Bucanero Cove, Espumilla Beach, Puerto Egas, Rabida, Chinese Hat and Mosquera Islet. 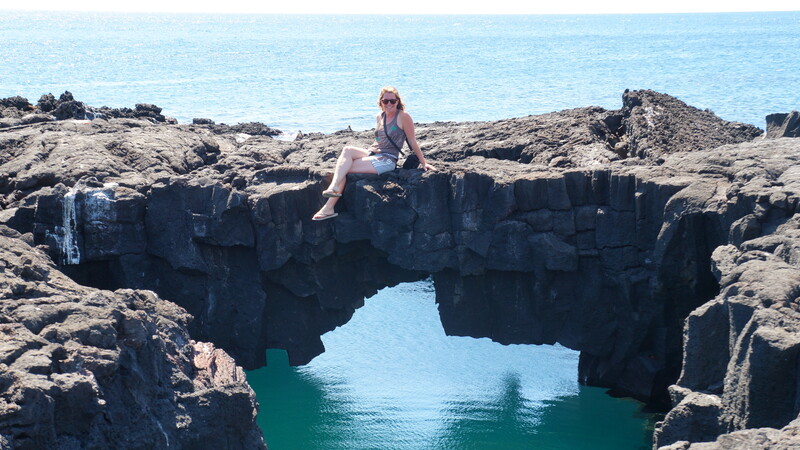 Travelling independently on the islands was slightly more restrictive but we were still able to visit gorgeous beaches, snorkeling spots, coastal walkways, highland villages, fresh water lakes and lava tunnels to name but a few. 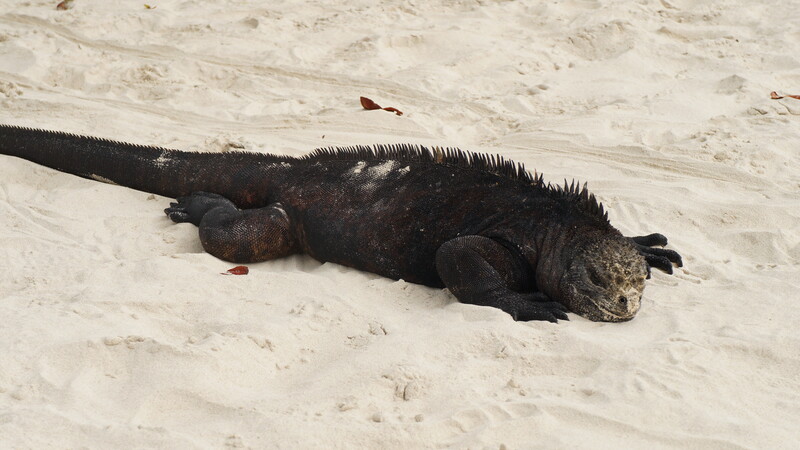 We found that even the simplest activities, such as lying on the beach, became sensational as we were joined by sunbathing seals and watched prehistoric looking iguanas strut their stuff. 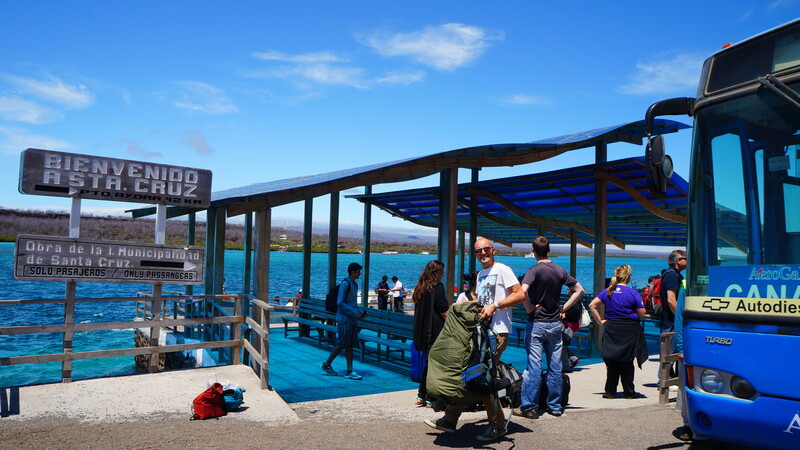 We were met our ‘naturalist’ guide (not a naked guide as I had originally hoped, just one who specialises in Galapagos nature) at the airport and taken by bus to the port, where our boat, King of the Seas, was waiting for us. We boarded the boat from the stern and a small doorway led to a larger than expected galley kitchen and a couple of general seating areas with cushioned seats and long wooden tables. The cabins were towards the front of the boat and down three small steps. We’d been expecting something really basic with shared bathrooms and bunk beds but what we actually got was a double bed made up with fluffy pillows and a flowery duvet with a private bathroom. 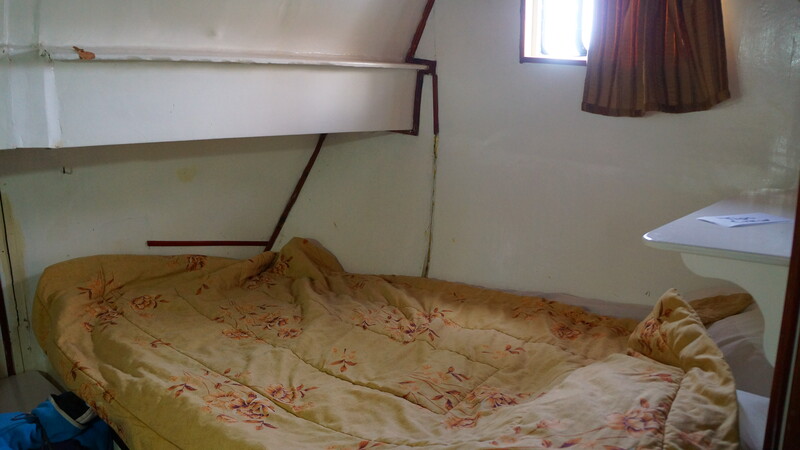 There was no denying it was cosy – in fact we could almost touch all four walls from where we stood in the middle of the room but there was enough space for us and our luggage and that was all we needed. We dumped our things and headed to the top deck of the boat where other people had gathered to make introductions and marvel at the scenery which was already pretty spectacular. The weather was bright, with only a few clouds in the sky, and warm enough to enjoy the changing vistas. The water looked very inviting – small waves lapped around the boat and the only thing to interrupt the clear, turquoise sea were pelicans bobbing on the surface filling their large bills with fish, and birds comically called ‘Boobies’, who circled above the water hunting for fish, diving like torpedos, disappearing from sight under the surface, only to bob back up with a fresh fish dinner flapping in their beaks. We were all a young bunch aged between 25 to 45 and our nationalities were worldwide – UK, Australia, Germany, Canada, Israel and America. Our 6 man crew for the trip had made good initial impressions with warm welcomes and were already hard at work getting the boat ready for our imminent departure and cooking lunch which smelt fantastic. There was the captain, first mate (who also drove the rigid inflatable boat or ‘RIB’), the chef, two young lads (who did domestic jobs such as making beds and serving tables), and our guide who would come to shore with us each time and offer us history about the islands plus facts about the wildlife and fauna. The anchor was raised and the engines started – we were off on another adventure. The landscape was rugged and in places had a prehistoric feel. 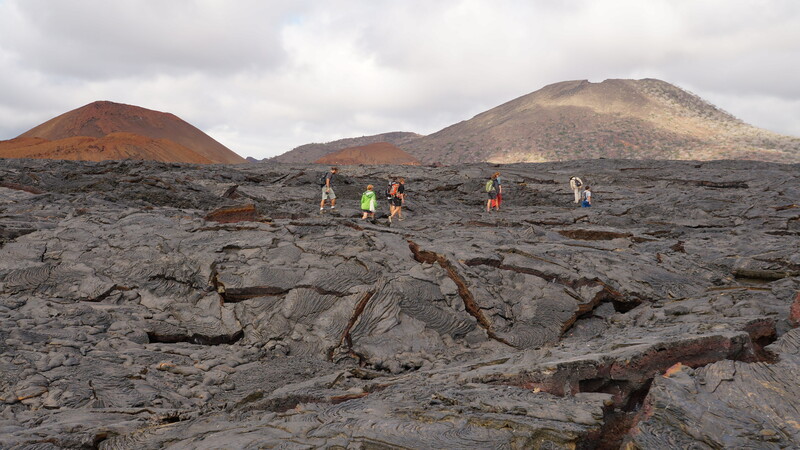 On several of our land based walks we clambered on top of lava flows which stretched for kilometres in every direction. We could really picture the red-hot lava oozing its way down to the sea and great plumes of steam rising into the air when it reached the water. 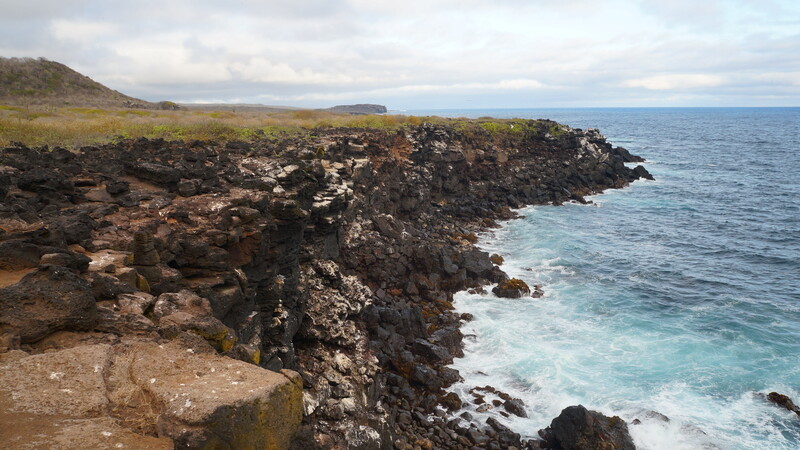 Near to the highland village of Santa Rosa on Santa Cruz island it’s also possible to visit vast lava tunnels where magma has formed waves and caverns of black rock. At the coast, the dark rock soaked up warmth from the sun and on one outing our group relaxed on the ground as our guide told us a little about how the islands were formed. The islands are located on the Nazca tectonic plate which is moving east/southeast, diving under the South America plate at a rate of about 2.5 inches per year. 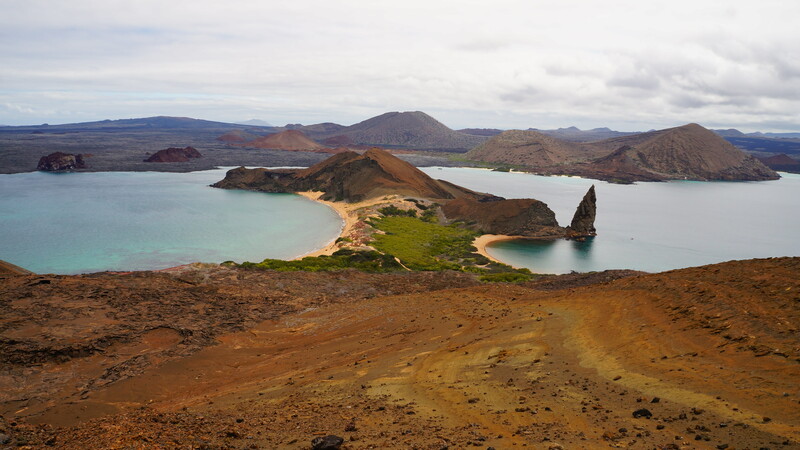 The islands are also situated on top of the Galapagos hotspot, a place where the Earth’s crust is being melted from below by a mantle plate, creating volcanos. 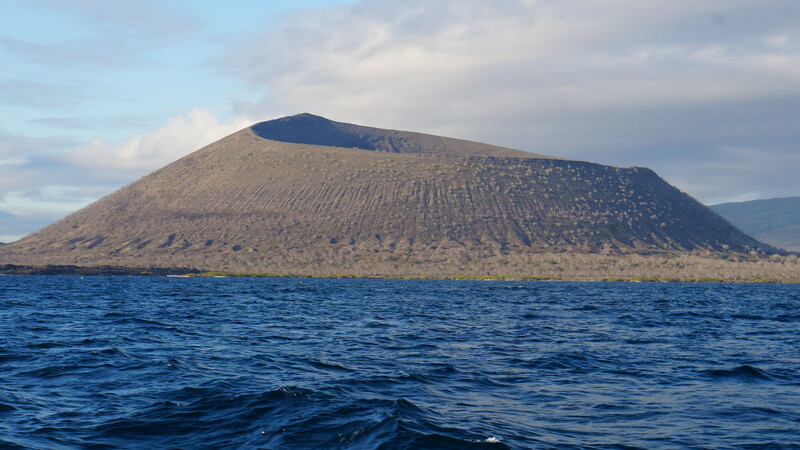 Scientists are not certain when the first islands were formed but they estimate it could be up to 90 million years ago. Whilst the oldest of the islands have disappeared below the sea as they move away from the mantle plume, the youngest islands Isabela and Fernandina, are still being formed. The lava we walked on whilst at Sulivan Bay was a modest couple of million years old whilst the most recent eruption on Fernandina happened in April 2009. 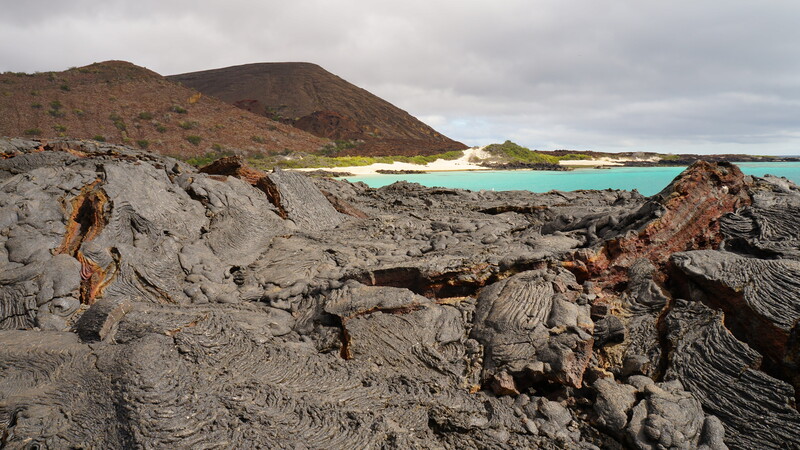 In 2005, scientists and volcanologists marvelled as a huge eruption on Fernandina spewed vapor and ash 7 kilometres into the air and a lava flow stretched down to the sea. 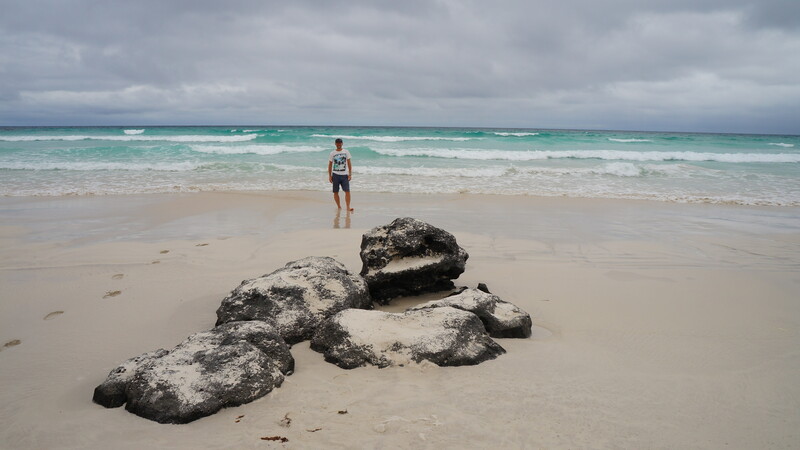 The beaches were dreamy and varied from place to place – from pure white powder to coarse red sand and tiny shells to vibrant yellow dust with dark marble patches. 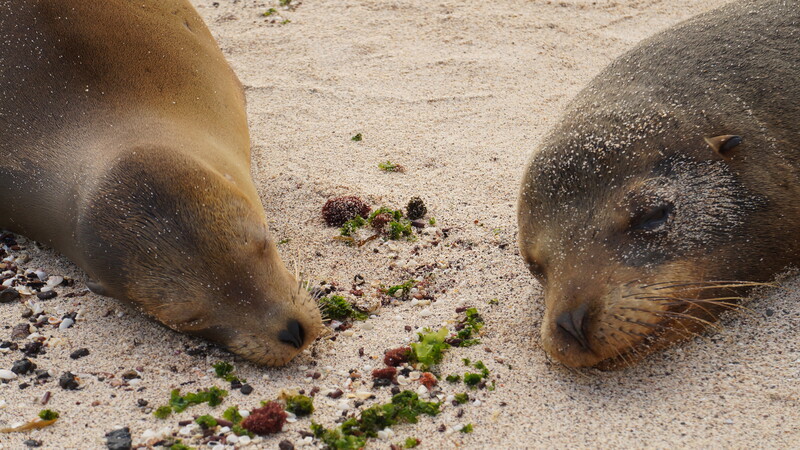 In some places big sandbars rose from the sea and created homes for colonies of lazy sealions while in others small crescents of sand were backed by mounds of compact ash and rock. 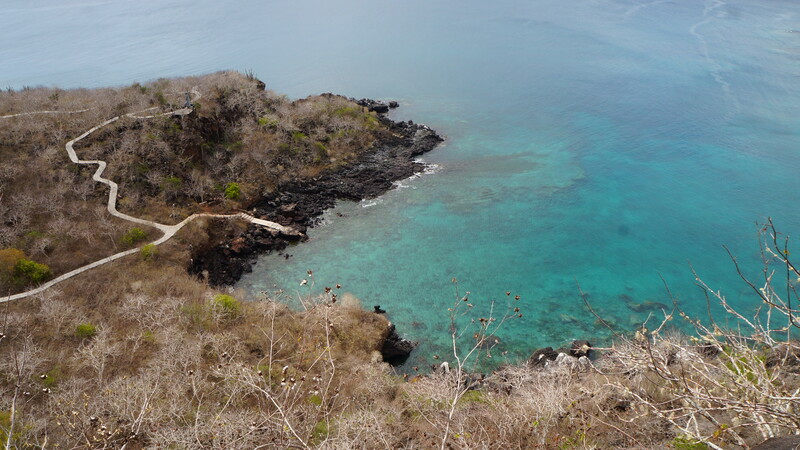 Rather than the beaches having a lush tropical backdrop, the volcanic nature of the islands meant that very little vegetation grew next to the shoreline and it was common to see bright white strips of sand backed by only a few green trees and littered with dark volcanic rocks. On the boat we were told that there would be two different types of landing – a dry landing, where the RIB would pull up to rocks or a dock for us to climb out onto and a wet landing where we’d float close to the beach and we’d wade ashore. We were to get time for relaxing at the beaches as well as informative walks to see different landscapes and animals with our guide. Our first stop on the cruise was Bachas beach on the north side of Santa Cruz. Behind the beach a long expanse of flat land suddenly rose when it reached the highlands, where low clouds hung ominously and lush green plants and trees grew big in the damp atmosphere. Our boat maneuvered into position and we all climbed into the RIB to be taken ashore. Our landing was a wet one but it was heavenly to feel the cool water on our legs and the silky sand between our toes. We followed our guide to a small bay where we were amazed to find the rusty wreckage of several old American barges from World War 2 buried deep in the sand. 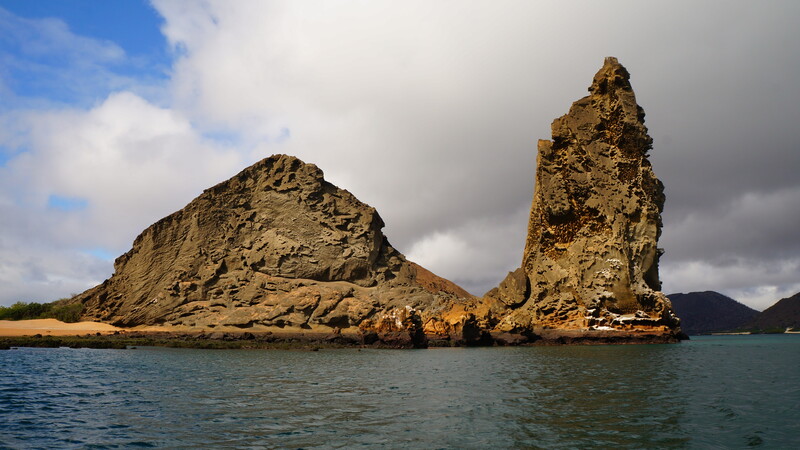 In the early 1900’s Ecuador found itself strapped for cash so during World War 2 they allowed the United States to use Baltra Island as a military base (tough gig!) and position radar stations in other strategic positions for a large sum of money. This offered the Americans protection for the Panama Canal and defence from the threat in the Far East, however, when the war ended, many of the ships and barges were simply sunk off the coastline or left to natures will on the beaches. Three metres of the barges lay buried beneath the sand, with only three inches still showing, so it was quite hard to imagine the full glory of these vessels but still, a fascinating bit of history. 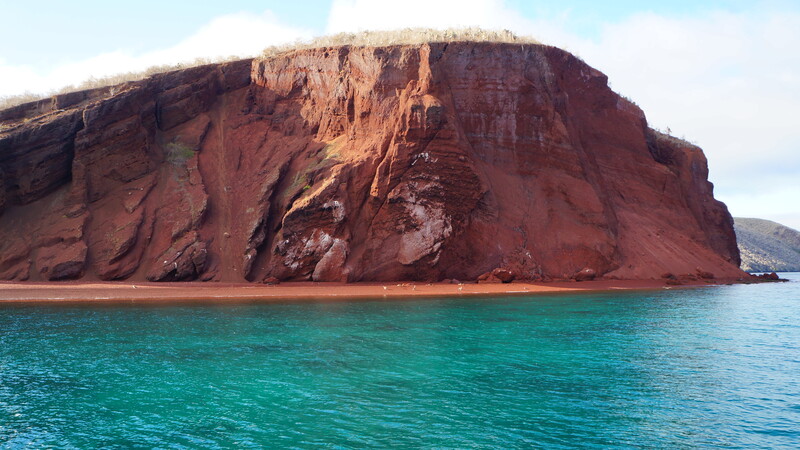 After seeing so many blindingly white beaches, we were surprised to find a huge swath of brick-red coloured sand backed by tall red buffs at Rabida Island. 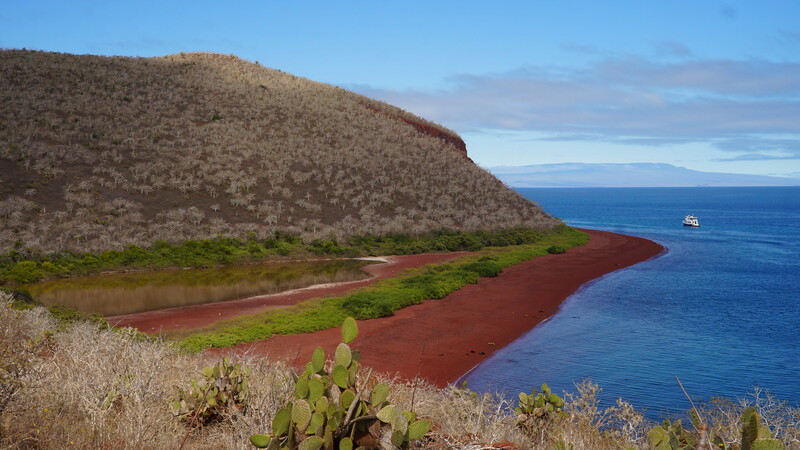 A circular walk led by our guide took us to a viewpoint overlooking the beach and we took pictures of the vibrant contrasting colours – red sand, blue sea and green shrubs and cacti backing the beach. 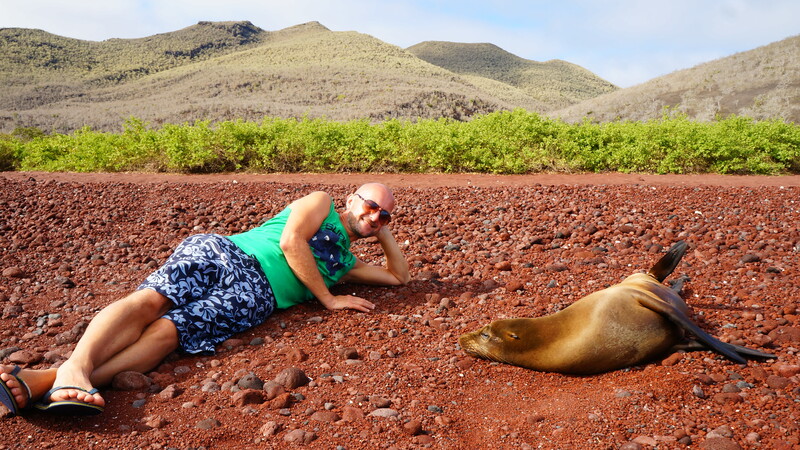 A group of sealions lay on the rough sand soaking up the sun’s rays and considering what a good life they have, Dan and I joined them for a few minutes and we seemed to fit in straight away! 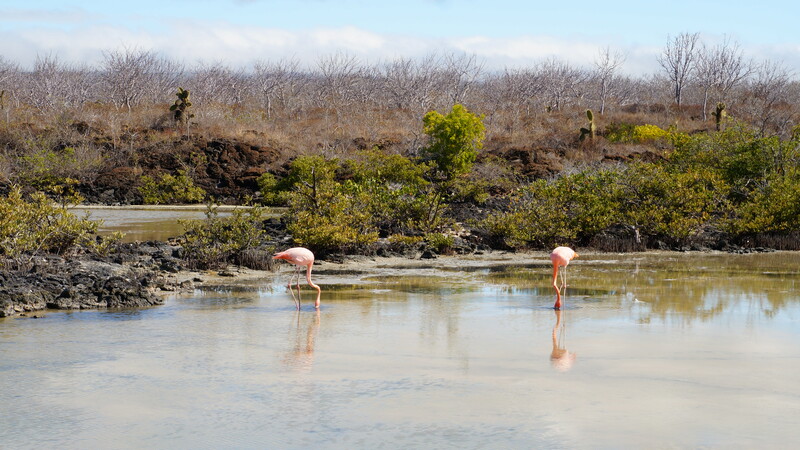 Set back from several of the beaches we visited on our cruise, it was possible to find small saline lagoons where bright pink flamingos looked like they were dancing as their legs stomped up and down stirring up mud to find tasty prawns, their main source of food. 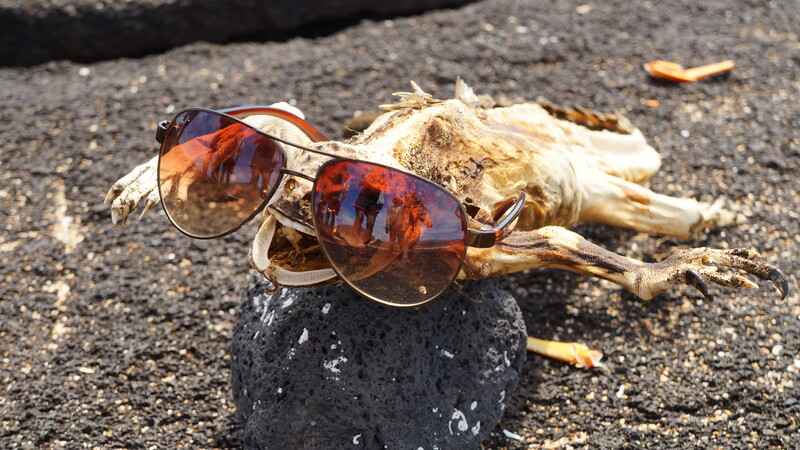 As with many of the birds on the Galapagos, the flamingos flew here from Central America and found life very comfortable with plentiful food and few predators so they never left. 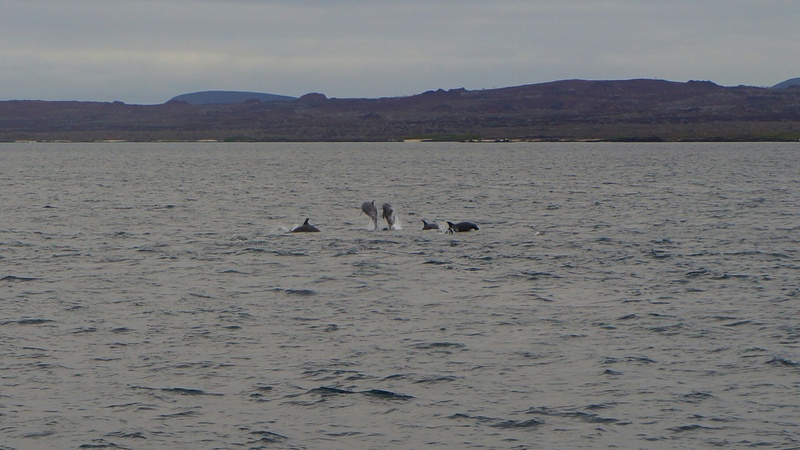 We certainly hadn’t expected to see these beautiful creatures so close to the sea and sandy beaches. 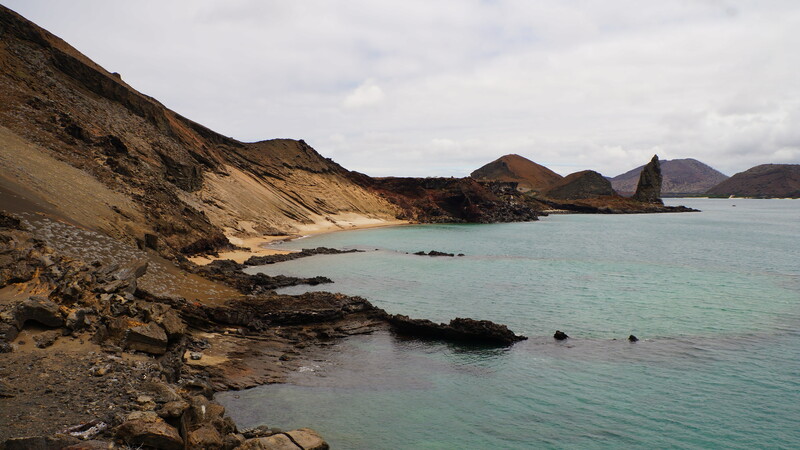 Exploring the main islands independently meant it was also easy to gain access to some spectacular beaches and one of our favourites was Tortuga Bay on Santa Cruz island. 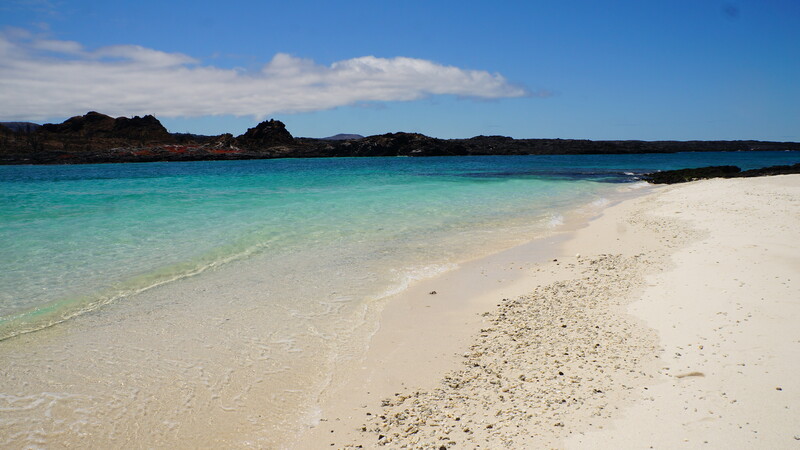 The brilliant white crescent of sand was dotted dramatically with dark volcanic rocks and bathed by turquoise water with white-tipped waves. We immediately kicked off our flip-flops, ran into the water and felt the fine sand beneath our feet. A calm lagoon at the end of the beach was the best spot for swimming and a sheltered walkway offered some good views out to sea and the occasional glimpse of a shark fin which got our hearts racing. Lizards basked on the beaches soaking up the sun’s rays and more than once we were so engrossed looking around us we nearly tripped over them. 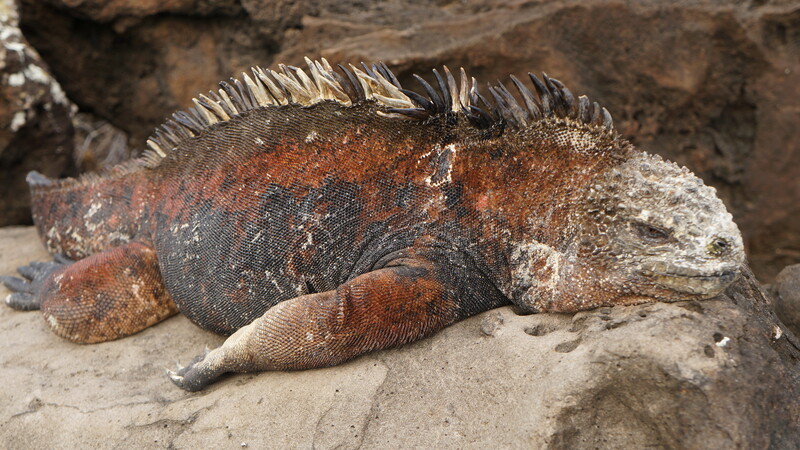 We learned that lizards are very social creatures and it was common to find orgies of them tangled together – rubbing skin and sharing body warmth. Their alert if we accidentally got too close was to fire a noisy jet of water through their noses – charming! 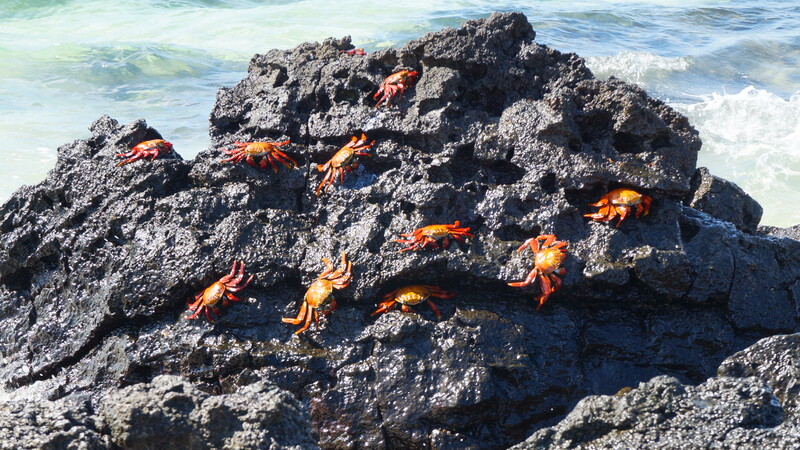 At nearly all beach locations, groups of bright red Sally Lightfoot crabs posed on the black volcanic rocks. 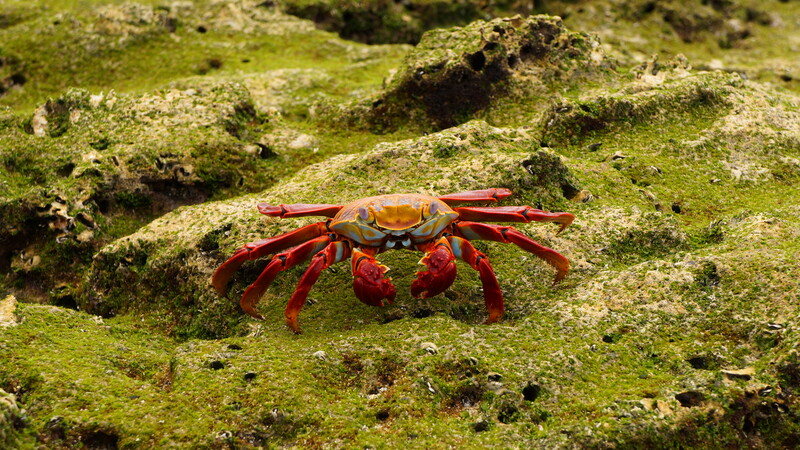 We’ve never really thought that crabs were an attractive species but these guys with eight scarlet red legs, orange bodies and pale blue undersides, were very handsome. 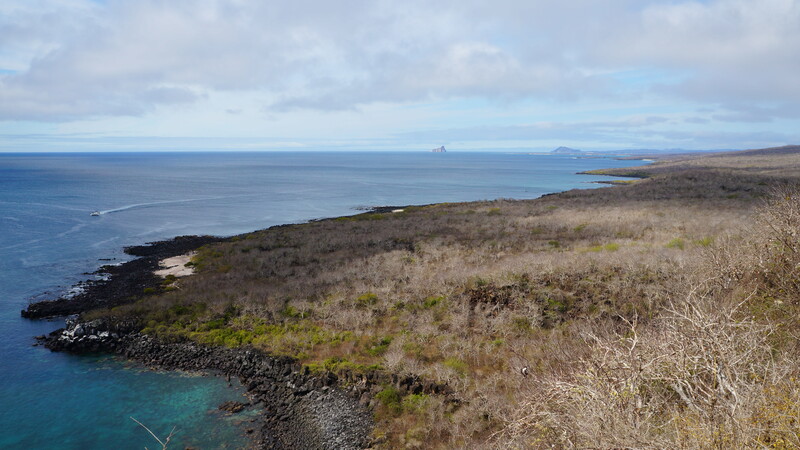 One of the most picturesque viewpoints in the Galapagos is on Bartolome Island. Our boat stopped by an unusual and dramatic rock formation which we discovered wasn’t a natural wonder but was in fact created by the army testing explosives many years ago. 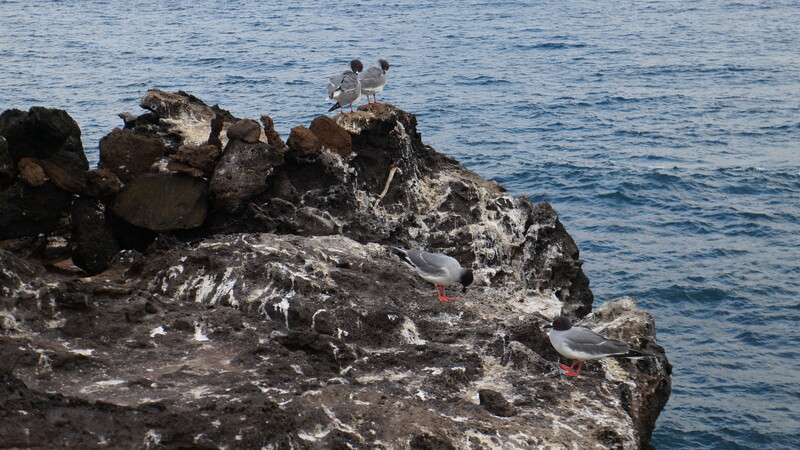 We clambered ashore and mounted steep steps lethargically as you’d expect from a spoiled group of Galapagos guests. The views from the top were worth every step. Black lava flows crept and twisted in sculptured formations framing brilliant white beaches contrasting with the deep blue waters. Boats of different sizes and classes bobbed below in the bay and birds floated above them on the warm currents. Our group got together for a team shot and with one click the moment was captured forever. The sun moved in and out of cloud cover casting ever-changing light on the scene below. It was a wonder steam didn’t start pouring out of our cameras as they were being used so much. The captain of the boat really knew some of the best places to moor up and he got an obscene amount of pleasure hearing our gasps as we gazed at another gorgeous landscape from the top deck. If the perfect symmetry of an island nicknamed Chinese Hat wasn’t enough for us, the brilliant white beaches and turquoise water really set the whole place off. The choppy waters and light breeze we’d encountered earlier that morning had disappeared and in this sheltered bay the sea was almost like glass. 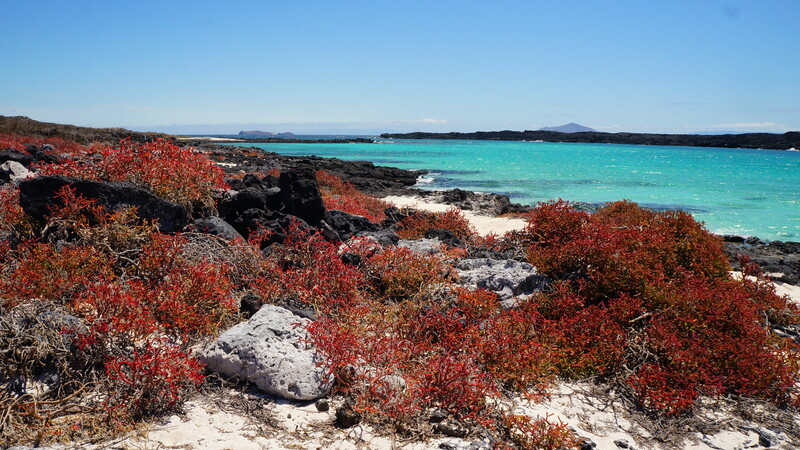 On the shore the sand was soft and rich like flour and the volcanic rocks were interspersed with wild red plants – it was a kaleidoscope of colours. On the mainland the great views just kept coming. 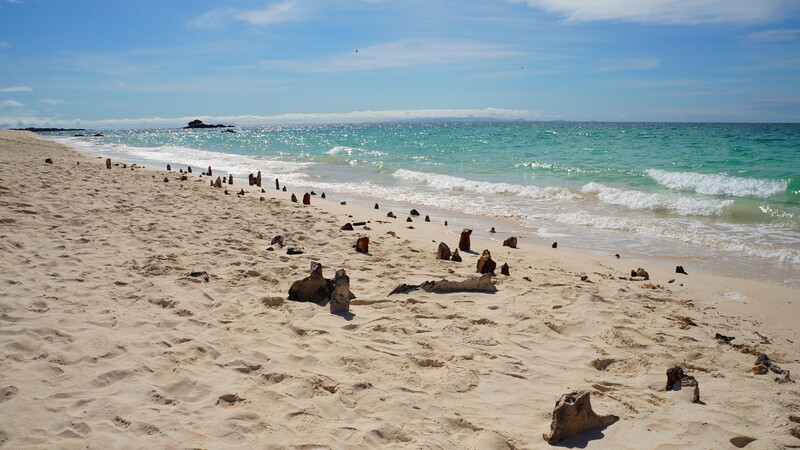 On San Cristobal, just 1.5 kilometres southeast from the main town, a network of wooden walkways curves around the coastline offering views of crystal clear bays and out to the horizon where it’s possible to spot migrating whales. 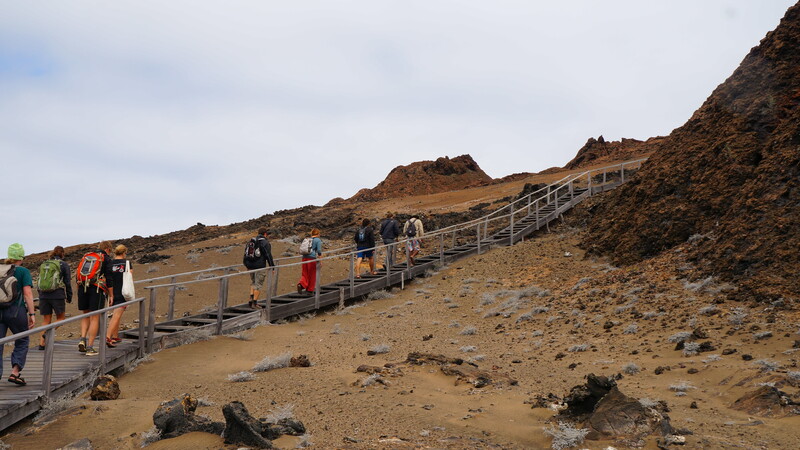 The trail leads up to the high platform of Cerro de las Tijeretas where we were rewarded with a beautiful overview of the whole area – the small settlement and a rugged interior crowned by highlands in one direction, the white beaches and blue waters skirting the coast in the other. In the other direction from town, a large sealion colony lives at Las Loberias beach and from there we enjoyed a two-hour return walk clambering over lava paths to high cliffs which are nesting areas for blue footed boobies and gulls. The steep, rugged cliffs and fierce waves crashing on the rocks below made it feel very dramatic. The boat in the evenings was a magical place. 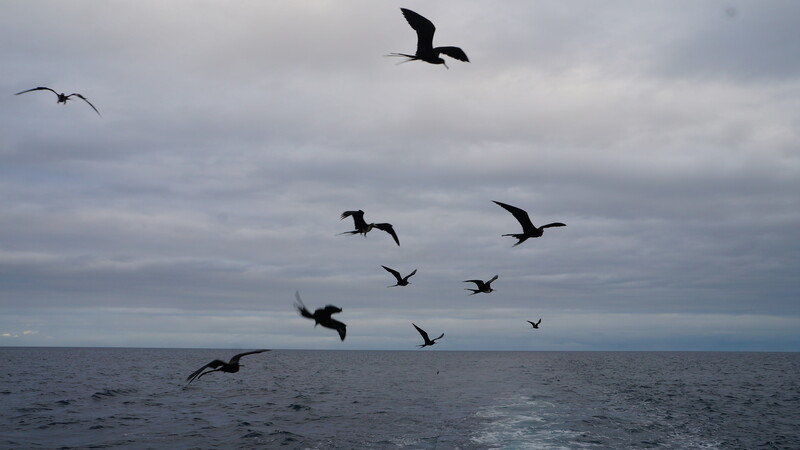 As our boat headed to the spot where we’d drop anchor for the evening, Frigate birds with black bodies, red scarves under their necks and split tails followed us closely – probably mistaking us for a small fishing vessel and waiting for some cast-offs to be thrown overboard. The captain would usually find a sheltered bay close to the water’s edge to moor up and cut the engine so the only sounds we’d hear were the waves lapping around the hull. Inquisitive dolphins often jumped around us showing off their acrobatics and from the deeper dark, water, occasionally a shark fin would circle the boat. The stars and the moon lit up the night sky, the Milky Way gleaming like a wide river of stars. 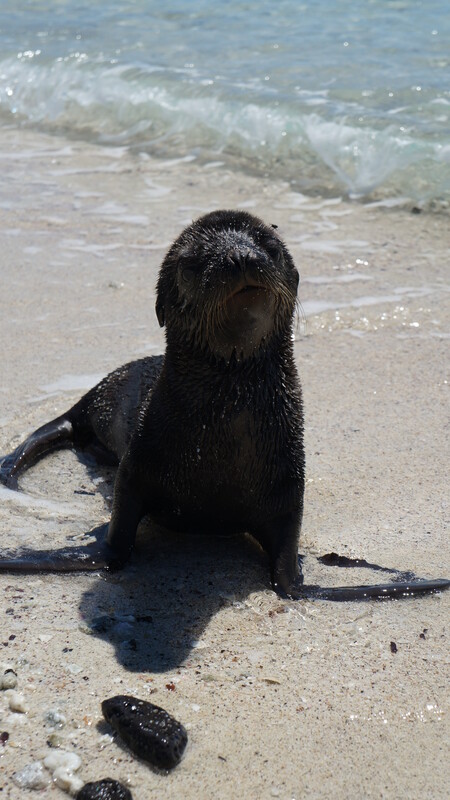 One night whilst eating dinner we heard a huge thud at the back of the boat and when we investigated a playful young sealion was sat staring at us with its fat grey head tilted back, barking. After dinner we’d receive a briefing about the plans for the following day and then have time relaxing drinking rum, chatting to our group or watching a movie. Sleep was usually around 10.00pm ready for an early start the following day. We slept like babies, gently rocked by the waves into a deep sleep. 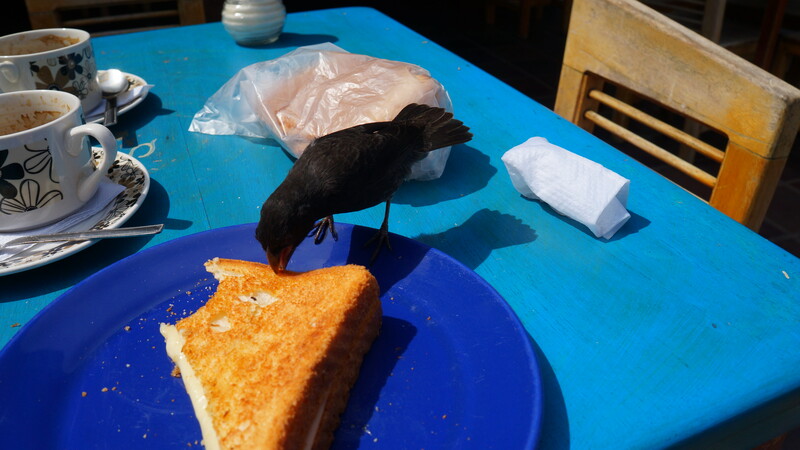 We were pleased to find that the main islands also had a good range of accommodation and eateries – with basic double rooms well within a traveller budget (around $25 USD) and set meals in family run restaurants for as little as $3 USD. 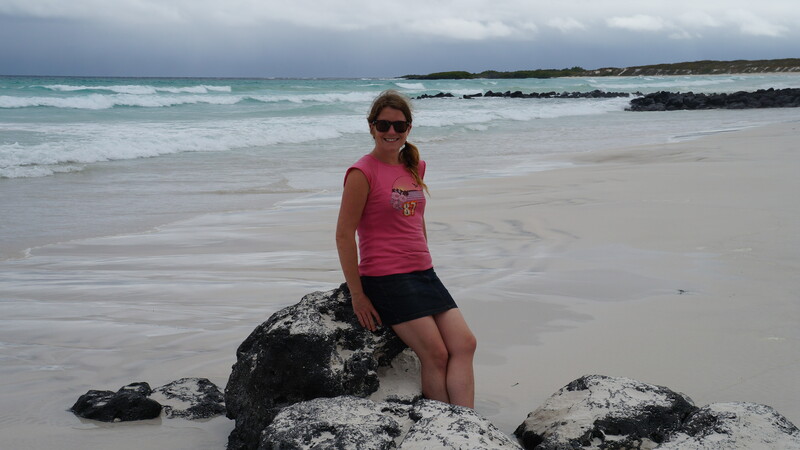 Of course, being the Galapagos, it was also possible to blow $28 USD on a basic medium pizza in a tabled-clothed seafront restaurant!! Paying less for our cruise didn’t mean we sacrificed quality or quantity of food. 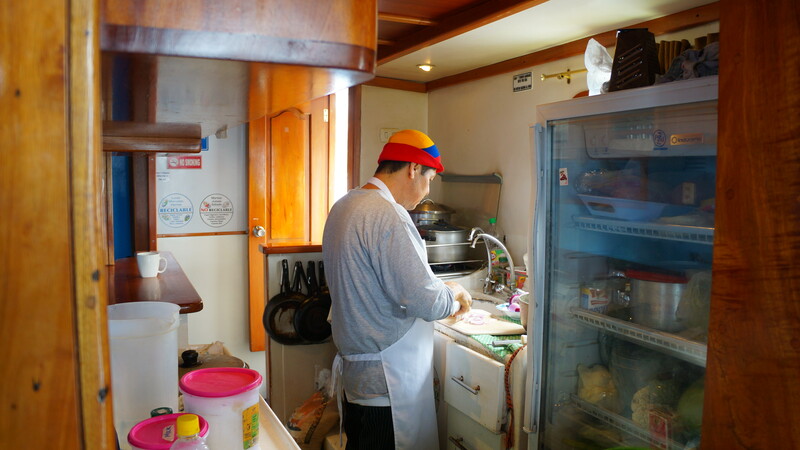 In fact we had a personal chef on board whose sole purpose in life was to cook us delicious fresh food in abundance. Along with three square meals a day, we were treated to savoury snacks, cakes and freshly squeezed juices each time we returned from a trip off the boat. Breakfasts, usually served from 7.00am, were big and filling, lunches were served as the boat moved between locations, and dinner at around 6.30pm each evening. The star of the show most days was fresh seafood ranging from cerviche to langostines, and prawns to baked fish. We’d receive big tasty bowls of soup before dinner and then thoughtful and varied meal plans with lasagna one evening and spicy vegetable stir fry the next. 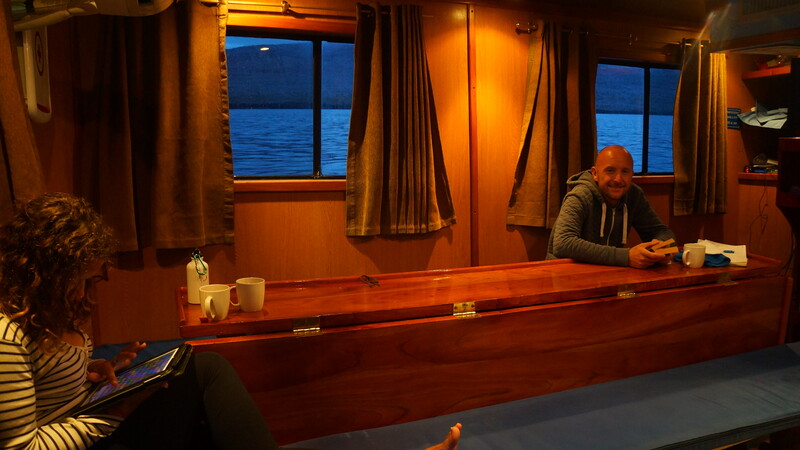 Two long tables in the living area of the boat seated all 12 of us together at one time. Even when we were full, our bellies would persuade us that seconds were the only way forward. 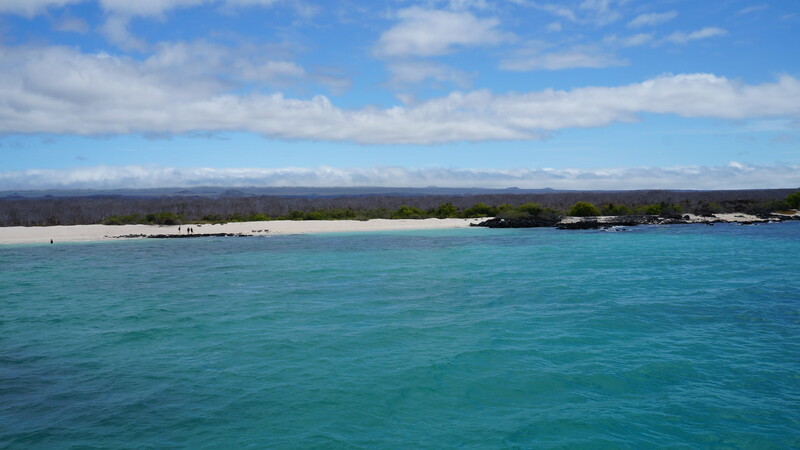 We were pretty convinced that the Galapagos Islands were going to impress us on land but for some reason we hadn’t thought about what it would be like under water. 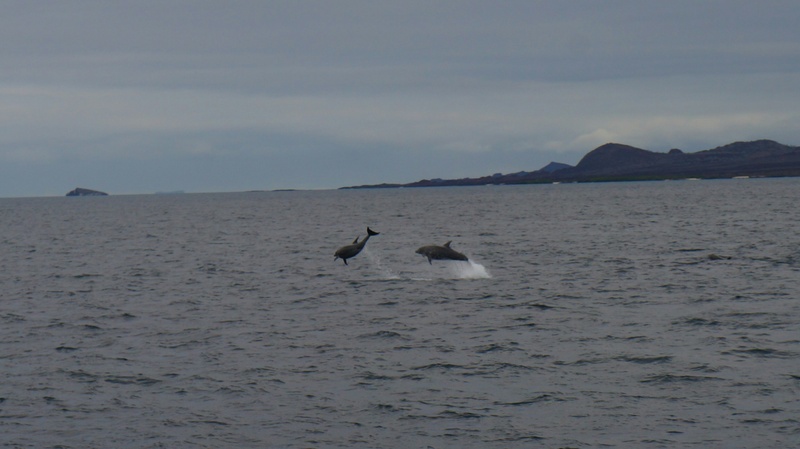 With an average of two snorkelling activities per day and occasionally more, we soon got very accustomed to life below the waves and we were blown away by what we saw. 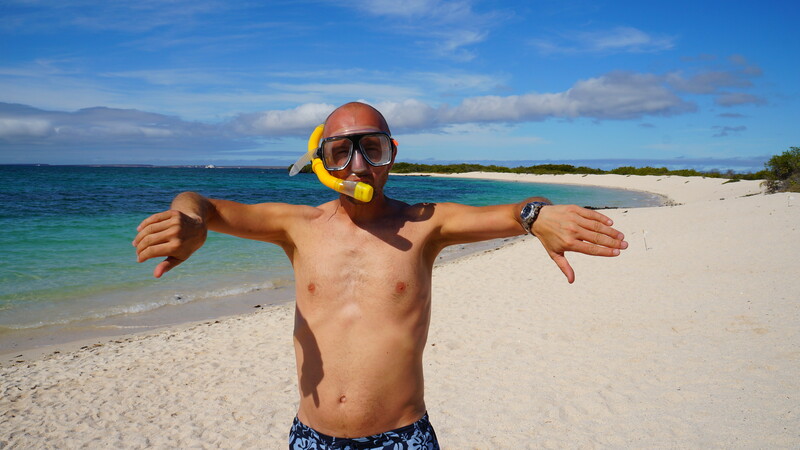 Obviously a snorkel is a key piece of apparatus for breathing underwater but in these islands we couldn’t help but make muffled “Ohh”, “Aghh”, “Wow” squeals into our mouthpieces like some pregnant whale basking in the shallows. The water was crystal clear and had visibility up to 20 metres. The underwater volcanic landscape was dark in colour and this made colourful fish even more vibrant. 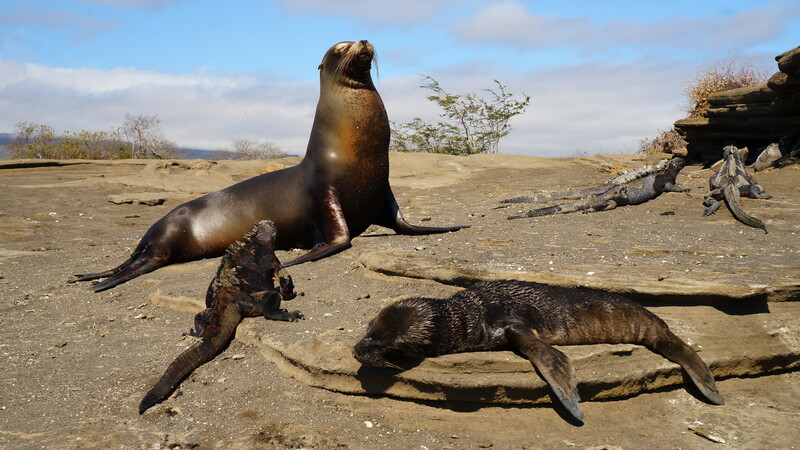 The Humboldt current makes the water around the islands colder (around 22 degrees) from June to November but also increases the number and variety of marine life so we were rewarded with something totally different each time we entered the water. At Sullivan Bay we had the good fortune to swim with penguins. 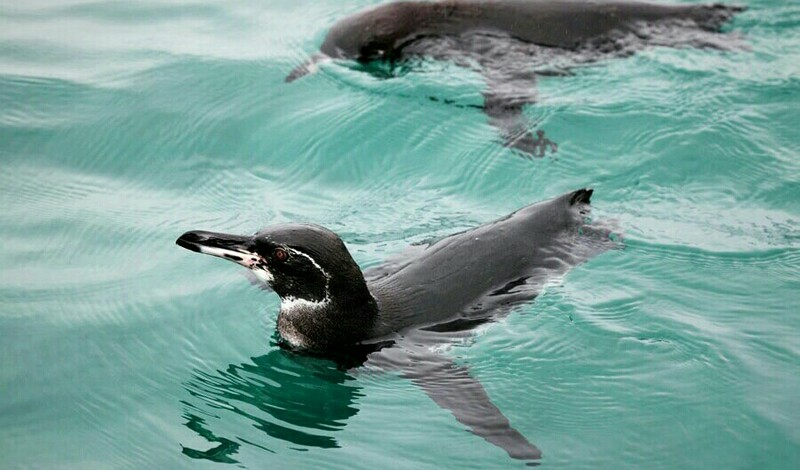 The Galapagos Penguin is the only species of penguin to live on the equator, with their cousins choosing to live in the cooler southern waters. 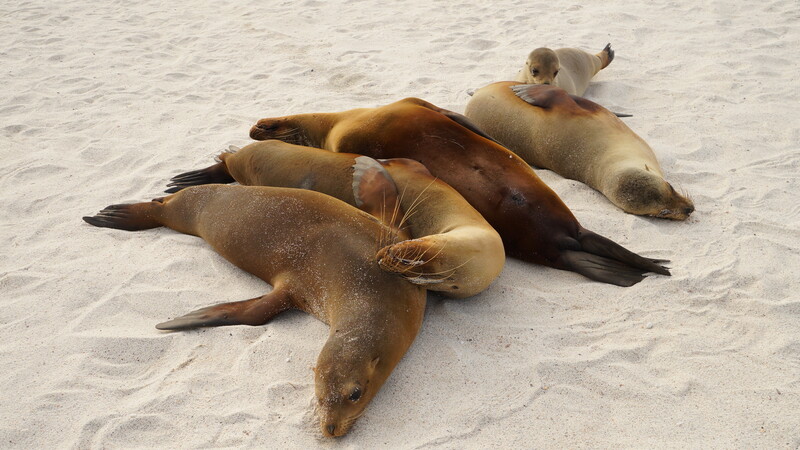 Notoriously comical and clumsy onshore, these warm-hearted mammals were fast and agile in the water. A group of around ten penguins initially passed us at a distance – checking us out and giving us only a brief glimpse of black and white. However, little by little they become more inquisitive and moved in closer for a second look. Recognising that we weren’t there to harm them, the group circled around us pecking at our feet and swimming towards our faces only to divert at the last moment. It was an incredible experience. Another underwater creature we were not so at ease with were the sharks. 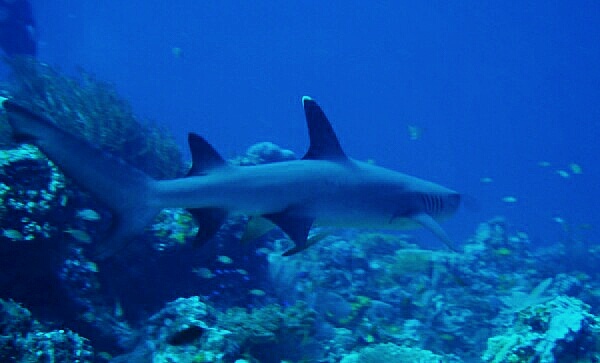 White tipped reef sharks gracefully skirted in and out of lava tunnels and rested on sandy bottoms feeling the sun penetrate the watery depths. They feed on plants and plankton and were not remotely interested in us but a childhood during the era of Jaws movies still had a hold on us as we looked into those lifeless dark eyes and imagined the rows of sharp teeth. On a couple of occasions over deep gulleys, we spotted the larger and occasionally more aggressive Galapagos shark and rather than following to take photographs, we’d turn and swim quickly in the other direction. 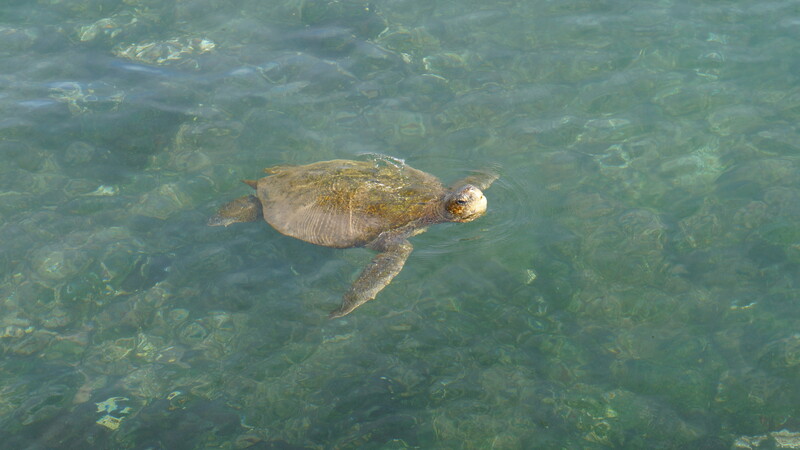 Graceful and gentle giants, the sea turtles would often emerge beside us in the water raising their long necks to the surface for air before sculling with their small flippers and gliding smoothly away. 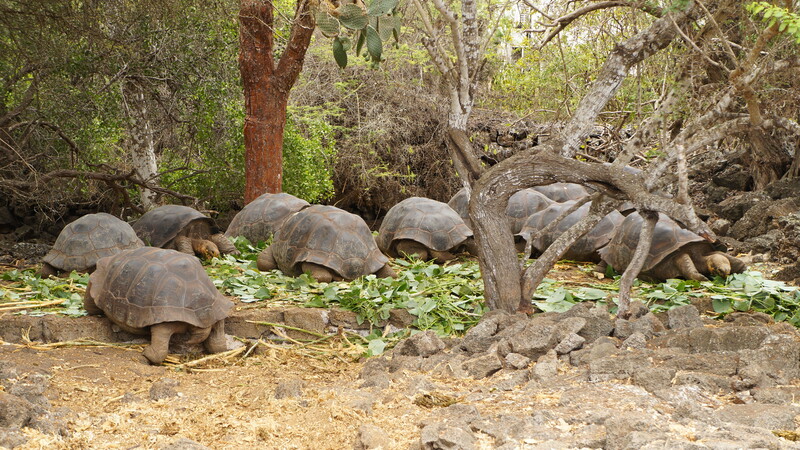 They loved to eat the green weeds which gathered around rocks and it looked like they were savouring every mouthful. Sea turtles can live to over 100 years old and continue to grow in size every year so some of them were the size of mini battleships. 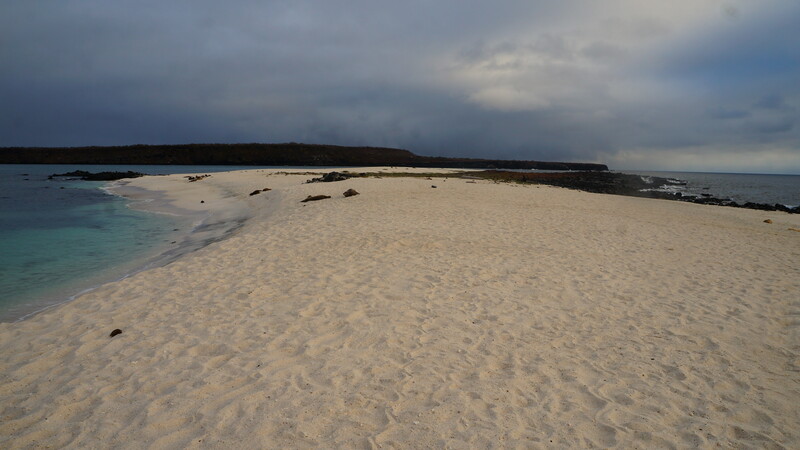 Several of the beaches in the Galapagos are turtle nesting sites and every cycle the mother clambers ashore and drags herself up the beach to lay hundreds of eggs of which perhaps only two or three will make it to adulthood. We walked along Espumilla beach and saw deep marks in the sand where the female turtles had struggled to move their immense body weight to and from the water. 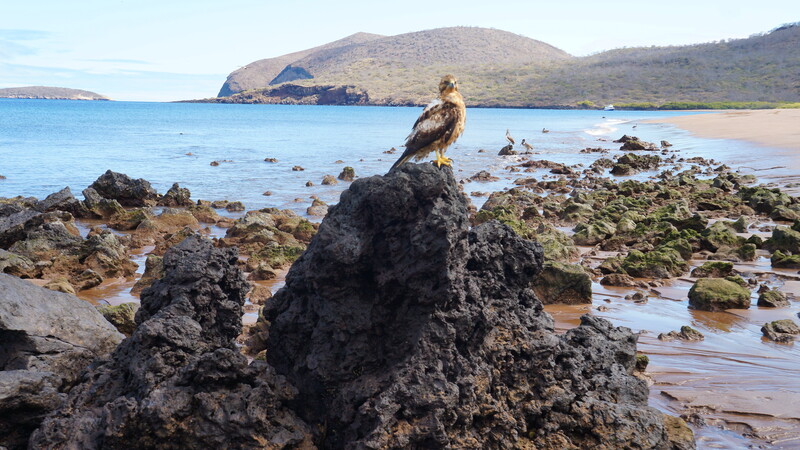 We were reminded just how cruel nature can be as we saw alert looking Galapagos Hawks lining the beach waiting for the babies to hatch and to pick them off as they tried to cover the distance to the sea. 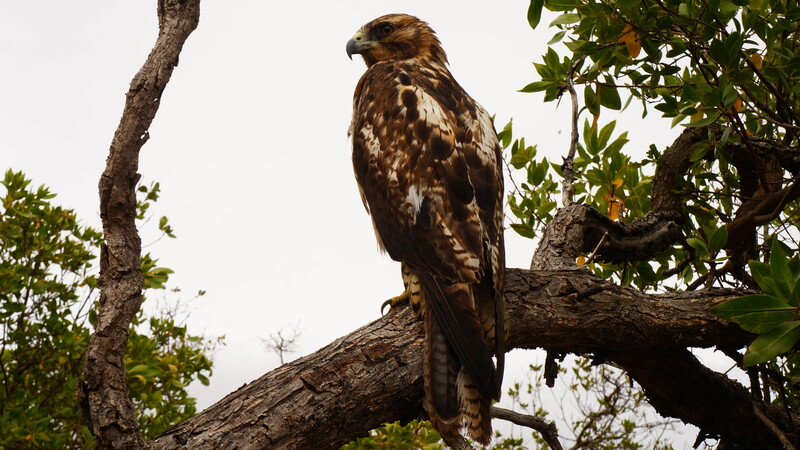 The hawks were unflappable (pardon the pun) as our group took it in turns to stand within touching distance for pictures with these amazing birds. 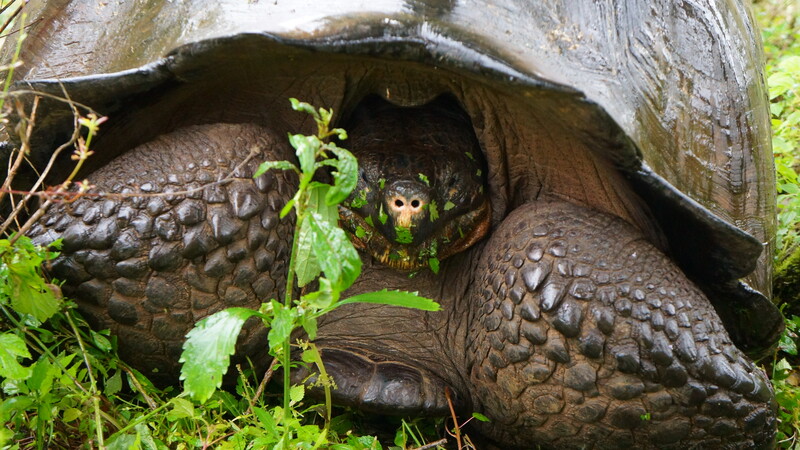 When Darwin and his explorer crew landed on the Galapagos, turtles were frequently on the menu for them too and at one stage they were hunted until their numbers became dangerously low. 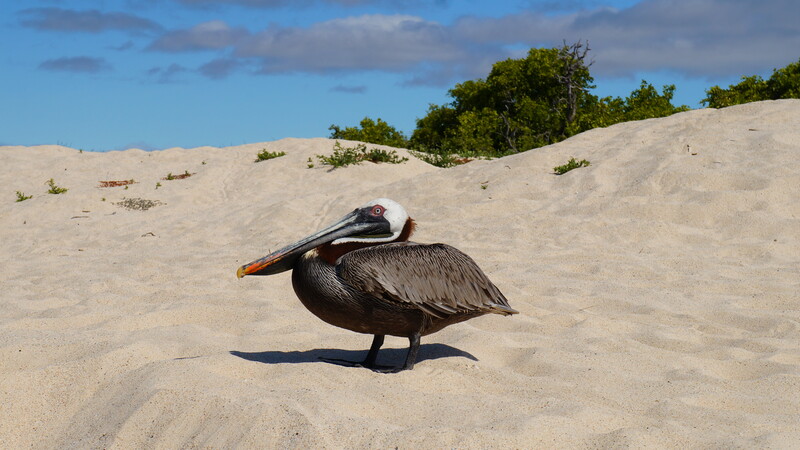 Recovery has been slow but we hoped that protected parks such as the Galapagos would help ensure their survival for generations to come. Stingrays impressed as they flapped their wings and looked like they were flying. We’d heard that Manta Rays are one of the giants of the oceans but nothing had prepared us for snorkelling over its dark grey mass the same size as a mini bus. We knew something good must be under the water as we approached a group of snorkelers splashing around with delighted faces – for a few moments all we saw was shoals of fish and then…there it was…emerging from the dark shadows. Its face and mouth on its underside looked far too small for its body. We were transfixed for 30 seconds and then it was gone again. As a gruff male seal barked from the shoreline, a group of us entered the water a little further down the beach, edging ourselves in as the freezing water lapped further up our bodies. Before we were fully submerged we felt a splash of water at our backs and we turned to find who the culprit was…but no-one was there. And then it happened again! 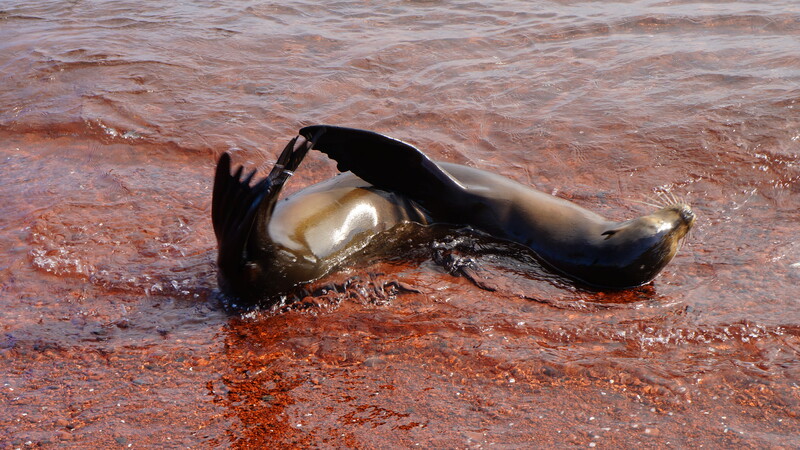 We put our heads under the water and came close up with three playful sealions. They swam circles around us looking us in the eye as if to say “Chase me!” We tried our hardest but we were out-swam at every twist and turn. Their energy never lapsed and when one of us mere mortals became tired they turned to another. 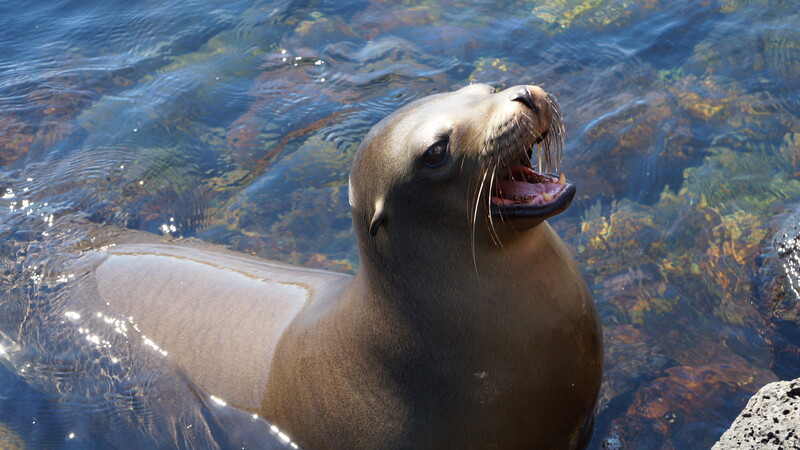 Three of us got a shock swimming after the smallest sealion when all of a sudden we were confronted by the big male. We weren’t sure who was more scared in the end as he barked at us and we screamed loudly at him. On land the sealions were everywhere. 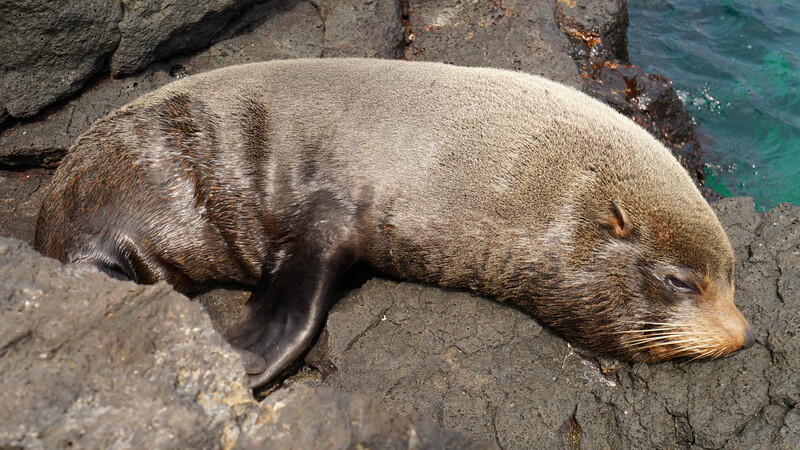 The Galapagos sealion was the most abundant and found on all of the islands whilst the Fur sealions were fewer in number and only found on certain places in smaller colonies. 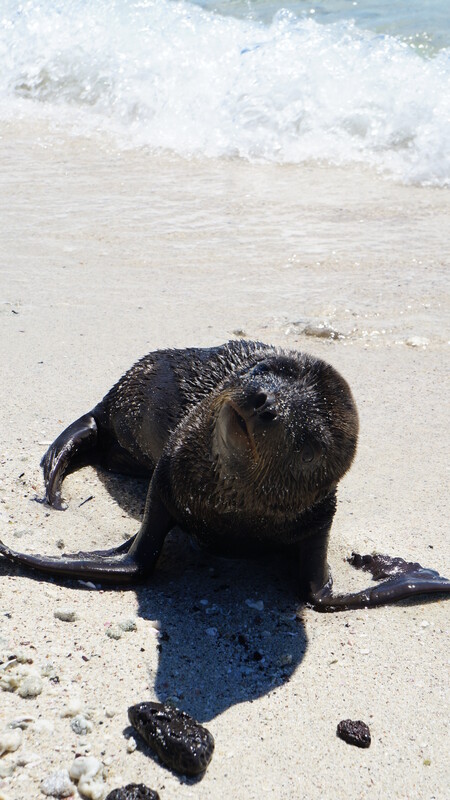 Looking at the big brown eyes and chubby face of a baby Fur sealion, we couldn’t believe that these gorgeous creatures were hunted close to extinction during the nineteenth and twentieth centuries and only now as a protected species are their numbers starting to recover. 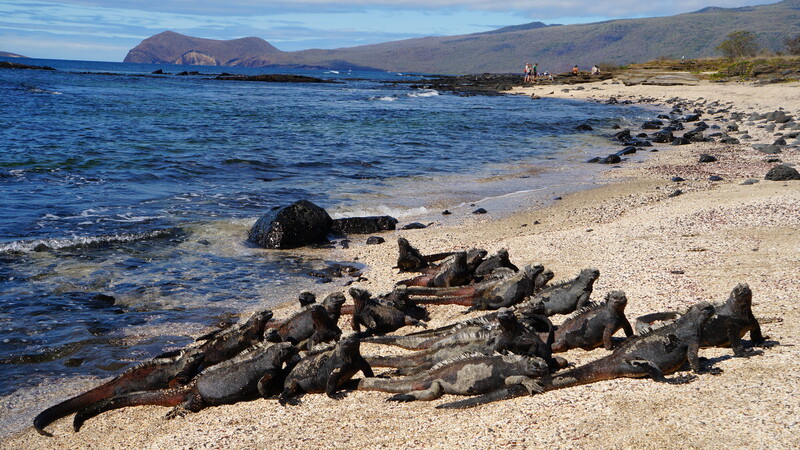 Males live with a harem of females (sometimes up to 15 – lucky guys) on selected beaches and defend their territory from other single males who challenge their position, and from predators. 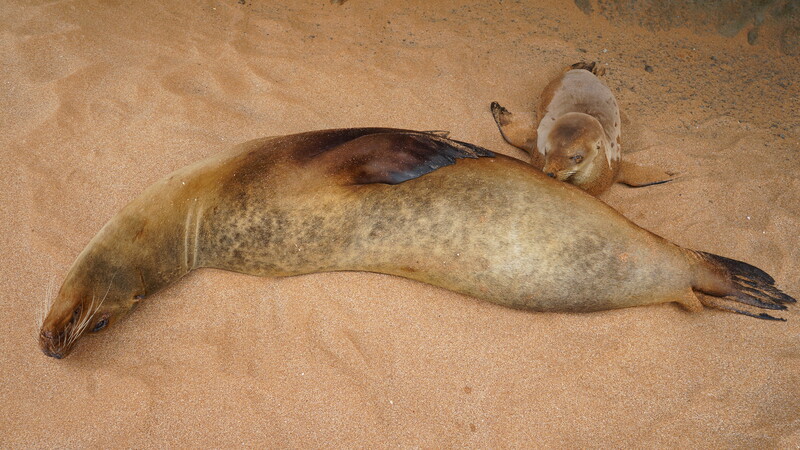 When we were on the islands we were lucky enough to see several new sealion pups on the beaches with their mothers. We were able to stand right next to babies suckling from their mothers without disturbing them and some of the pups were very curious and playful with us. Even though it was extremely tempting, we didn’t touch the babies as our guide had informed us that the mothers know their children best through a sense of smell and if we were to affect that, the mothers may abandon them. Compared to the dry islands, the highlands which can be found on the larger islands, receive significantly more rain so the plants tend to grow big and plentiful. 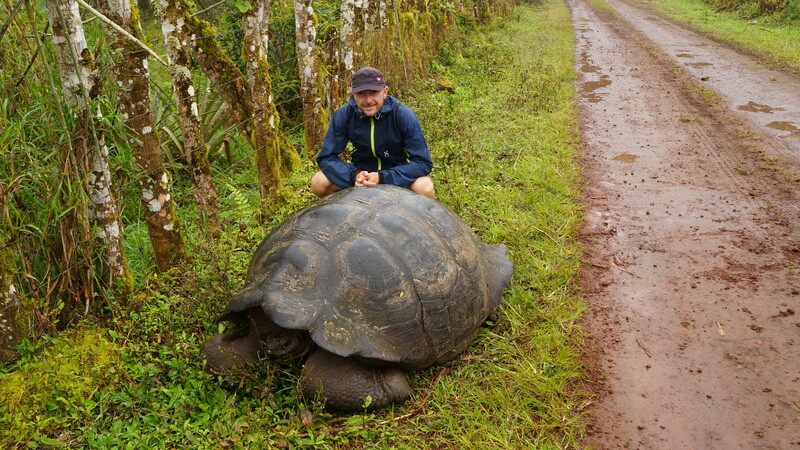 At first we thought there was little reason to leave the sun-filled beaches and surrounding seas teeming with life…but then we realised there was one large reason at least – giant land based tortoises. 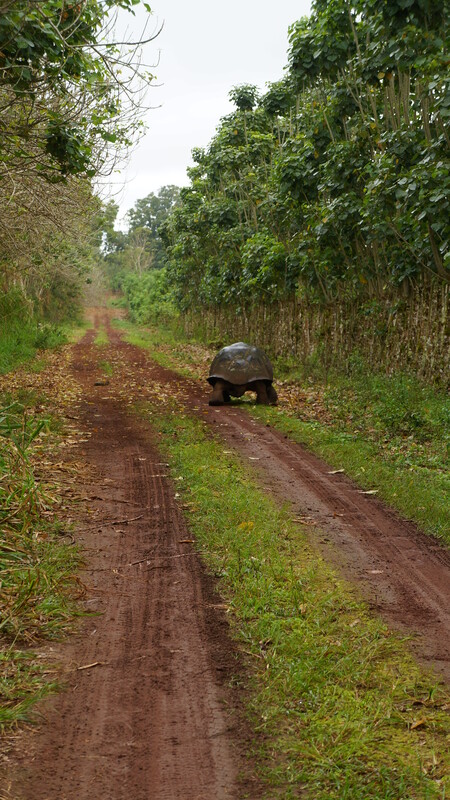 We took a shared taxi from Puerto Ayora to Santa Rosa in the highlands and walked down a muddy track towards El Chato tortoise reserve. 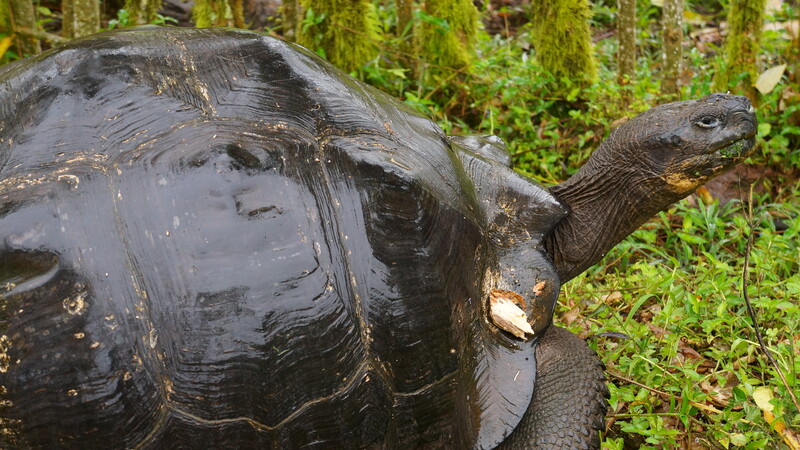 It wasn’t long before we met with the rain and then…the tortoises. 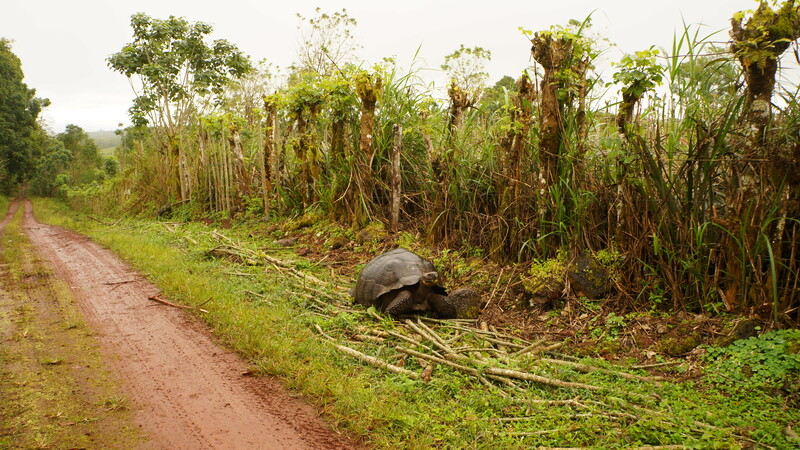 Despite their large size, they were scared when we approached and quickly retracted their long necks, heads and legs inside their shells with a hissing sound, which we guessed was the compression of air. We stood very still close by and sometimes gave them a cuddle from behind and they relaxed realising we weren’t going to hurt them – mechanically popping back out to their normal shape. Everything from walking to eating was done in slow motion with a considered and wise look on their faces. We thought about all of the history which had passed in the lifetime of these noble creatures, some of which would have lived for up to a century – the invention of television and the internet, two world wars, the first moon landing, the shooting of JFK, the death of Elvis…what stories they’d have to tell! The Galapagos wasn’t somewhere we associated with rough seas and big waves but this is the Pacific Ocean, 926 kilometres away from continental Ecuador, and in some open spots the sea can be fierce. 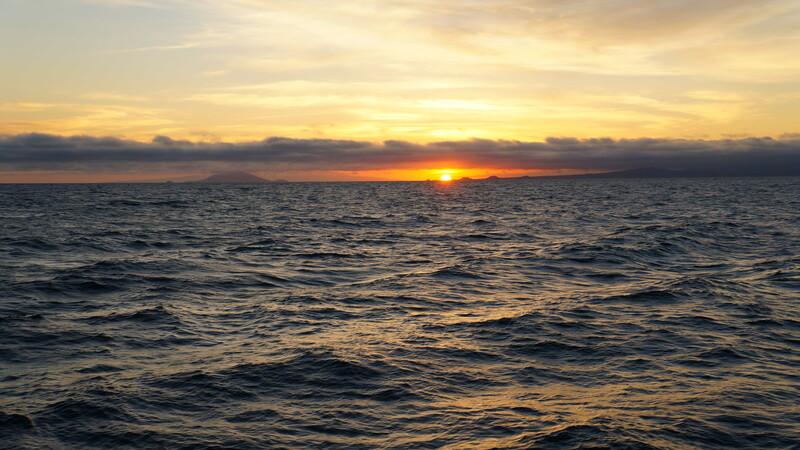 On our first evening on the boat we spent nearly three hours crossing a channel from Santa Cruz island to the bay we’d explore the following morning. The severe rocking of the boat was exciting at first and we all giggled as our things moved around the table. As the swaying continued, Dan and I headed to the top deck to get some air and watch the sunset. The horizon was firmly in view and the air was refreshing but try as I might I couldn’t settle and I started getting that tell tale churning feeling in my stomach. Leaving Dan with the camera for the all important sunset shot, I made my way back to our cabin where the toilet bowl became a close friend until we finally anchored in a sheltered and calm bay at 7.20pm. Not the glamorous start I’d expected to my first evening on the boat. 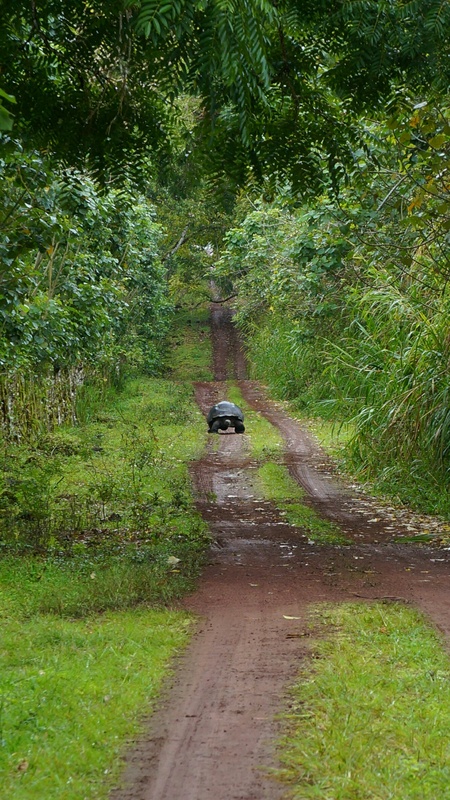 We had also had a particularly rough crossing from Santa Cruz to San Cristobal. For nearly two hours, our medium sized, 40 person capacity speed boat became airborne, attacking large waves and then slapping hard back onto the water’s surface with a back jerking jolt. We hit one wave so hard that the force as we landed knocked the captain clean out of his seat and onto the floor, stalling the engine in the process, and making a few people distraught, fearing we may be about to capsize. Surprisingly, the islands are also home to around 26,000 people – the majority of whom live on Santa Cruz, San Cristobal and Isabella. 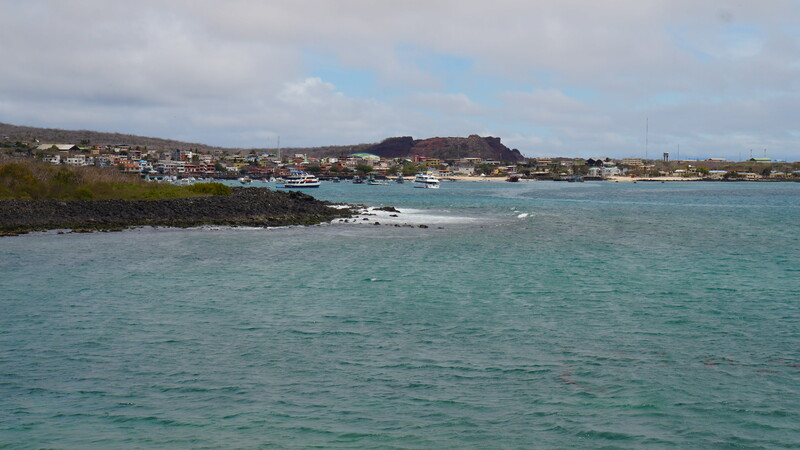 We found both Puerto Ayora (Santa Cruz) and Puerto Baquerizo Moreno (San Cristobal) to be completely charming. Puerto Ayora feels a little more developed and touristic than smaller, rustic Puerto Baquerizo Moreno, as this is where the majority or cruises depart, but both were relaxing and beautiful places to stay, where boats or scooters are the preferred means of transport and animals rule the roost. 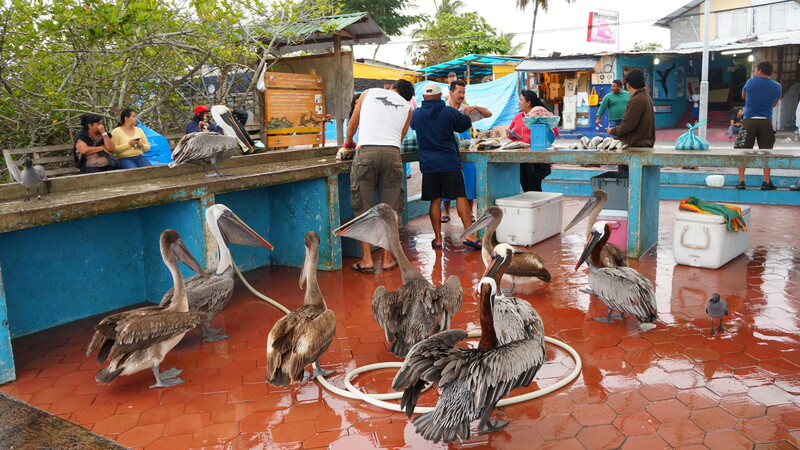 We laughed at the pelicans in Puerto Ayora fish market as they lined up cheekily waiting for the off-cuts and, whilst eating fresh cakes from the bakery, small birds surrounded us almost sitting on our laps. 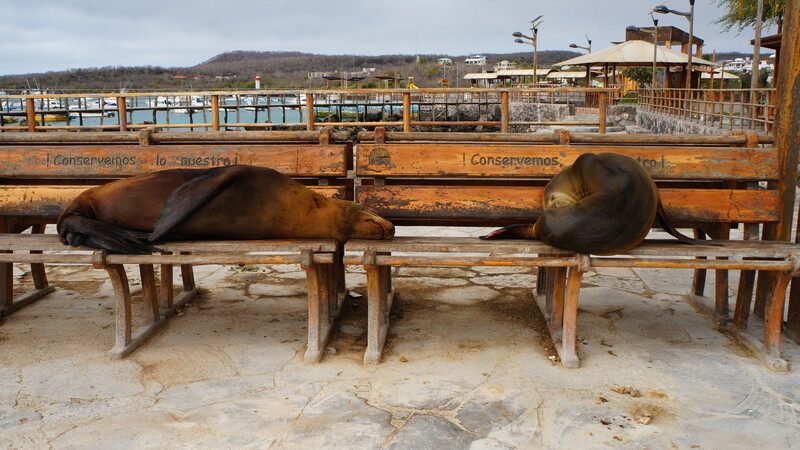 And in Puerto Baquerizo Moreno the sealions were so laid back they reclined on benches along the promenade, flippers either side of the wooden plank. Interestingly, our guide on the cruise had already offered us some history and context about the conflicts faced on the islands between the permanent residents and the need for conservation. 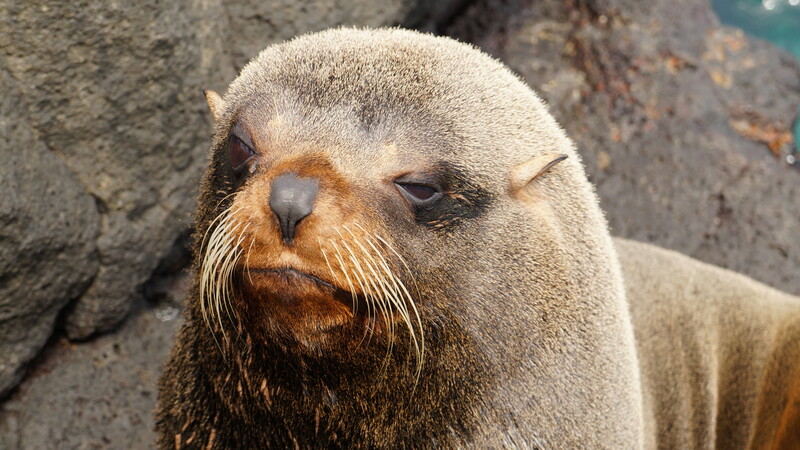 The problems include over-fishing, pollution and waste management, oil spills, illegal fishing for sharks, lobsters and sea cucumbers, the poaching of sealions for their reproductive organs which are sold to the Asian market and the introduction of non-native animals (such as pigs and goats which they are now trying to irradicate as they destroy natural habitats). 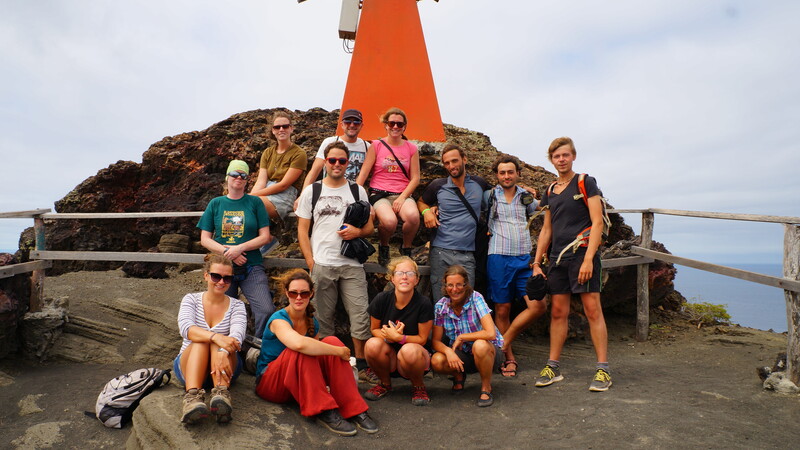 Of course we also had to consider that our own presence on the islands as tourists also has a big impact on the fragile environment and we tried our best to behave responsibly and respectfully. 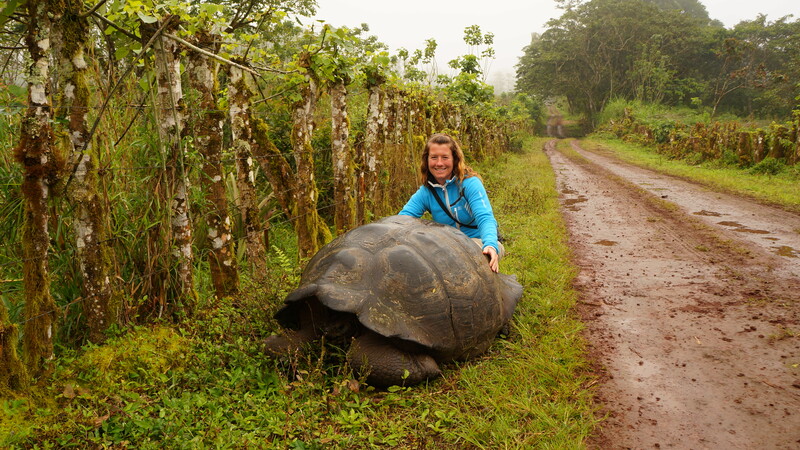 When it was time to leave the Galapagos islands we knew something had shifted inside of us and our outlook on the world would always be slightly different. 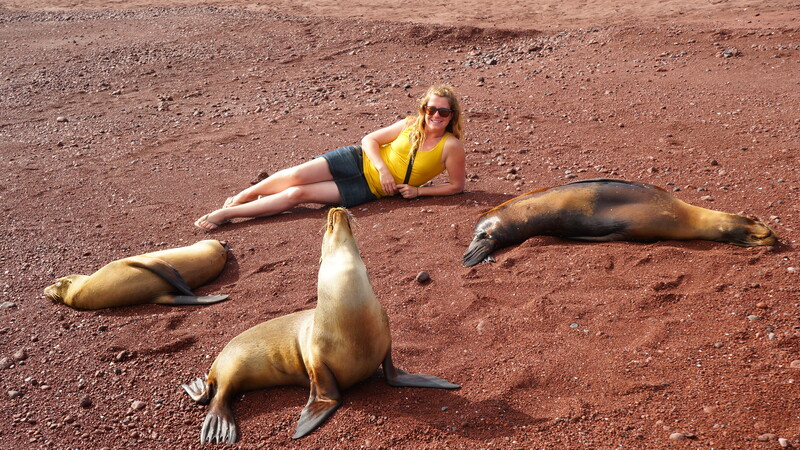 We’d been welcomed to the volcanic islands by the animal inhabitants and they had treated us as equals. We felt saddened and ashamed that their warm welcome was such a contrast to the way we often treat animals – cutting down their habitations, enslaving them to work in fields until they drop, filling the countryside with non-recyclable waste and casting football pitch sized nets into the sea unphased by what is hurt or killed in the process. We knew our current way of living wasn’t sustainable for very much longer and if we wanted to preserve the world for generations to come we’d need to stop turning a blind eye to what’s happening around us. 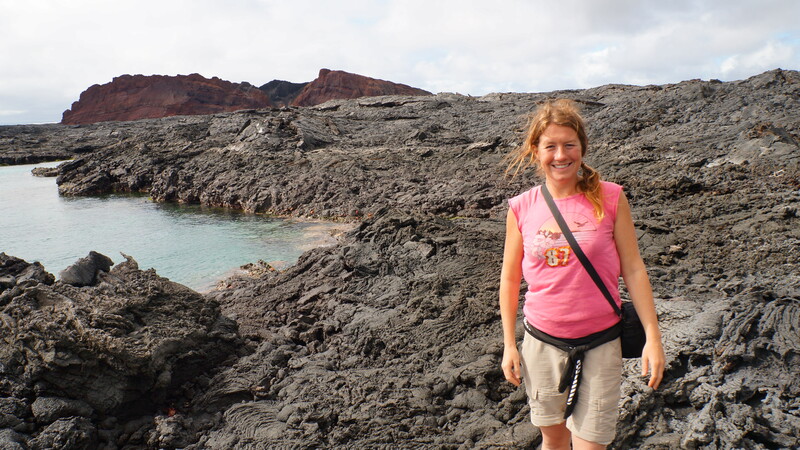 We’d seen species and behaviour unique to the remote islands. Evolution had not only tweaked and honed the genes necessary for basic survival, it had, as with humans, ensured these animals were perfectly adapted to their surroundings so their communities grew strong and flourished. Were they really that much different from us after all? We weren’t sure if we’d ever have the chance to stand eye-to-eye only one metre away from a hawk again or to roll around in the surf with playful sealions but we were certain that our respect and love for the creatures we share the planet with will never falter and we’d endeavour to change some of our personal habits to help in some small way to protect this wonderful world we live in. Thanks Marie – we’re cramming those memory banks with good times! A lot of nice Pictures, are there permision for pining some on pinterest? Greetings from Lima – Peru.